Our posts about our first ‘major’ trip away – 3 weeks travelling Scotland’s equivalent of ‘Route 66’. I guess the big question is not necessarily “Did we enjoy it” (I think the blog does an effective job of proving that), the question we should be asking is “Would we do it again?”. The answer is an affirmative “Yes”. We may not follow exactly the same route, we may pass through some places that we stopped at this time and see what other adventures await us. The great thing that Janette and I have taken from this trip is the utter beauty that lies within our reach. OK – it may be a long haul up there for those that like to motorhome a little closer but it is worth the effort – and one does have to say it is an effort. The driving can be a little ‘tight’ at times, single track roads with passing places – but you know what – those actually create an element of respect with the majority of drivers we came across. Pull in (because you and everybody else has no choice) and a wave and a smile was the ‘norm’. 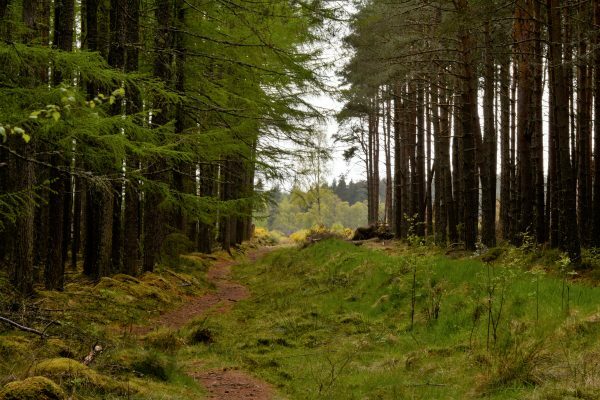 Perhaps we can learn something from this, courtesy on the roads is something that is sadly lacking – I think a mandatory 2 days driving on Scottish single track roads should form part of the driving test! The sense of freedom we experienced when wild camping was also something that surprised us both – we definitely want to experience more of that. Being able to pull up late afternoon loch side with a stunning view, wake up in the morning with no cars, nobody, just the wildlife will be something very simple that we take away from this trip. In the words of Arnie “We’ll be back”. 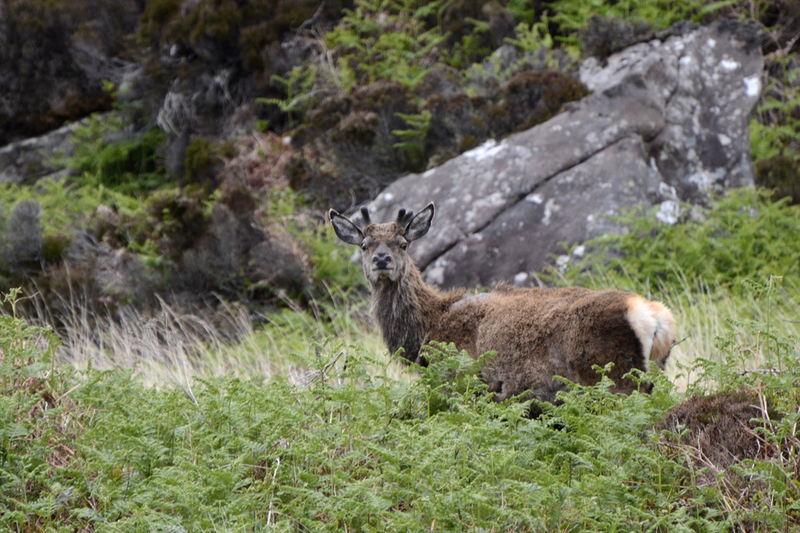 This entry was posted in North Coast 500, Our 2nd year, Travels in Hilma and tagged Forsinard, Handa Island, Inverewe Gardens, Kyle of Tongue, NC 500, Scotland, Tarbet, wild camping on June 13, 2017 by studio1901. Having sampled the delights of the Oban Distillery single malt last night (plus a pint or two!) I was now regretting ringing Neil from the Coulin Estate last night to book a morning’s trout fishing on Loch Bharranch. I had arranged to meet Simon one of the estate workers at 10:00am Lochside. It turns out his wife was the chef at the Kinlochewe Hotel, good job the food was excellent. 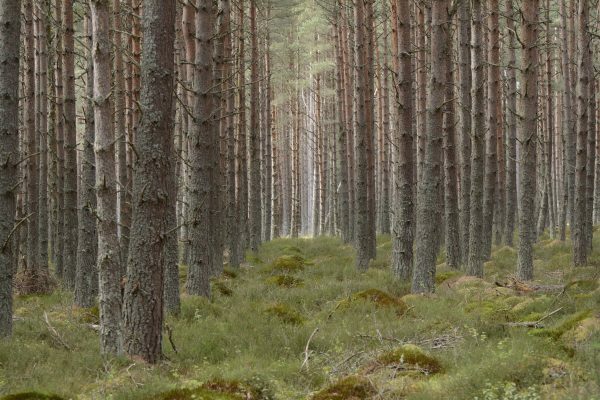 Before going on, just a note about Kinlochewe CC site if you stay there – don’t park under the trees, as these are like Picadilly Circus for midges. Try and get in the open. T’internet is non-existent really and whilst I thought the Kinlochewe Hotel was a good idea after finishing our meal to go and get the laptop to update the blog, it was not a good idea. Everybody had the same idea! Could have written a letter and posted it and it would have got wherever quicker. I tried to upload images etc. but just ended up wasting battery time (which I forgot to replenish back at the site after the beer and whisky!). Lesson learned. Might look into a spare laptop battery if we are going to do more wild camping. 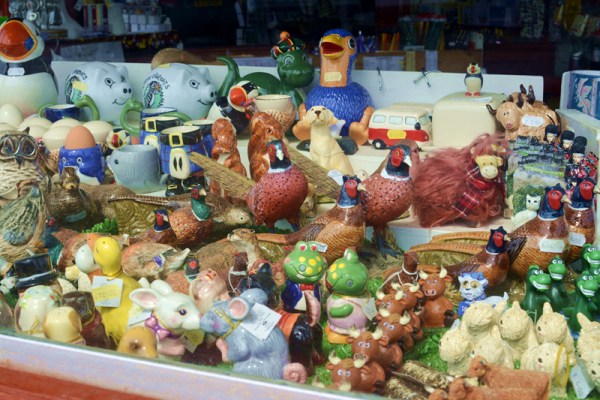 More information on the Kinlochewe site – just before we set off a butcher, baker and candlestick maker van arrived on site tooting his horn, Janette shot off like she was competing in the 100mtr olympic dash, and won! Fresh veg, fresh meat, bread, milk and even the obligatory ‘Tunnocks’ caramel biscuits (which must be eaten on this tour) could all be purchased off the van. We saw him later in the week in another village or two showing off his wares so if you are in this area ask around for when the ‘Kenneth Morrison’ van will be around. Anyway, I ramble. On to the fishing. The wind was starting to rise so I knew I had to get going, Simon pointed out the best spots but really they would be governed by the wind. Working my way around the small loch the best was early on, had two small trout when the wind was not so strong and was behind me. Both trout took a Greenwell’s wet on the dropper and pretty quick on the take after the flies hit the water (dry fly on the point). Nothing else, and 2 hours later was back in Hilma warming up with some minestrone soup. A little treat for Ian as he is driving. We were now heading in the direction of Applecross made famous by Monty Hall’s BBC2 television programme. I remember a week ago whilst we were proud of ourselves for negotiating the Kyle of Tongue loch side road (not part of the NC 500) someone saying that he has no fear of ‘any road’ now having negotiated the Applecross route. What were we in for? We have not read any guides, we had looked at the North Coast 500 website but mostly just doing this on the fly so to speak. Getting to Applecross coming down from Kinlochewe was a piece of cake. Yes, single track roads with passing places (as are lots on this route – more on that later) but nothing to write home about. About 4:00pm we started to look for a spot to park up before Applecross as we thought it might be ‘rammed’ judging by all the other campervans and motorhomes we were passing. 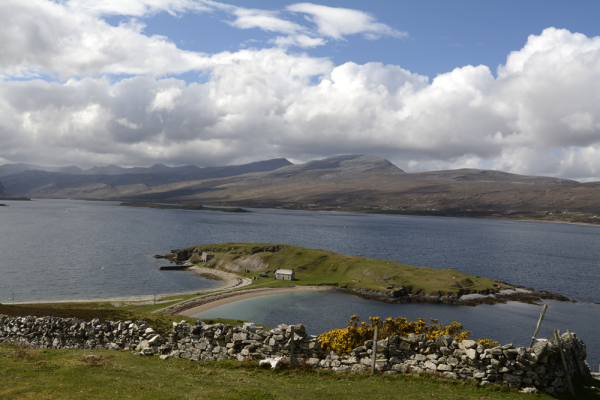 We found a lovely spot overlooking the ‘Inner Sound’ across to the Isle of Rona and the Isle of Rassay with the Isle of Skye behind them (N 57.27 853, W 5.51 745). Low cloud across the sound gave it an eerie feel. Hilma looking across to the Islands with envy. Not now Hilma, another time! We wake up to miserable weather, drizzle and low cloud. In a funny way though it has a weird kind of beauty, I guess it is the fact that it is a different wet and drizzle from your own back garden. Breakfasted we drove to Applecross – a stunning beach estuary and in hindsight there did seem to be plenty of places to wild camp around the bay, but hey, we are always finding somewhere new and we were more than happy with where we stayed last night. Always time to come back. Applecross did seem a bit touristy but with a decent pub, nice looking café and stunning views what else could be expected. Did see another motor-homer emptying his black waste down the public loos and wasn’t really sure what to think. Never having been in that position (which could have been on of desperation, I don’t know) as we have always gone to a campsite and paid our dues for that. What really upset me though was he was using the public tap outside the loos to clean his cassette. Now I didn’t see any signs saying this was why the tap was there, there may well have been, and if so I hold up my hand and apologise. I just couldn’t help thinking about the cross contamination if walkers, cyclists, etc. needed some fresh water. 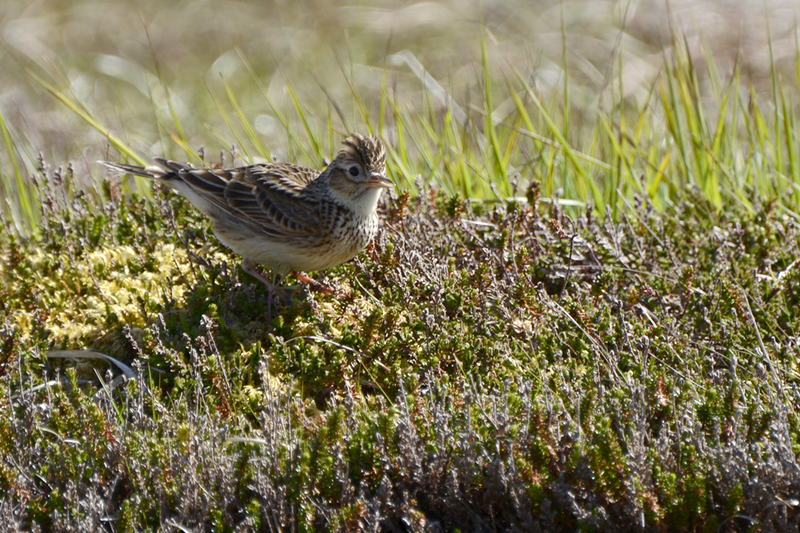 Rant over, but if anyone knows that this is OK at Applecross let me know and I will correct the blog. Not much for us to do at Applecross as we had quite a drive to get somewhere near the finish of the NC 500</a>. Little did I know the words of the chap saying he had ‘no fear of any road’ having done the Applecross section, would come back to haunt me. Neearrrgghhh – what a nerve jangling drive, definitely not one for the faint hearted or anything longer than about 8 metres I would think. We climbed out of Applecross admiring the views and thinking what a lovely site if were driving down into the village from this side. Then we kept climbing, and climbing, the road narrowing, cloud enveloped us, and yes, we kept on climbing. A single track road with passing places has been the norm now for plenty of miles on the NC 500, but this was something else. The passing places were shorter and narrower than on the lower roads, with visibility at 50yds this was no laughing matter. Somewhere near the summit (couldn’t tell because of the cloud) I pulled in to a large layby (which made me think it was the summit) for a brief respite. I’m sure in better weather and a clearer picture of the road ahead it might not be as bad as I am making out (wimp that I am) but today was not a good day to be doing this. At one point we were on a bend, stopped 1 foot from the Armco and a very steep drop with 2 rented campervans trying to get past us, I could have swore I heard metal scraping on stones, I know it wasn’t Hilma’s. Eventually after many hairpin bends and stoppages for passing vehicles we dropped out of the cloud breathing a sigh of relief, still a way to go down on the narrow road, but at least I could see the way now and pull over in plenty of time for oncoming vehicles. At the bottom I had to get out contemplate what I had just done, actually best not too, so I quickly got back in Hilma and on we went. 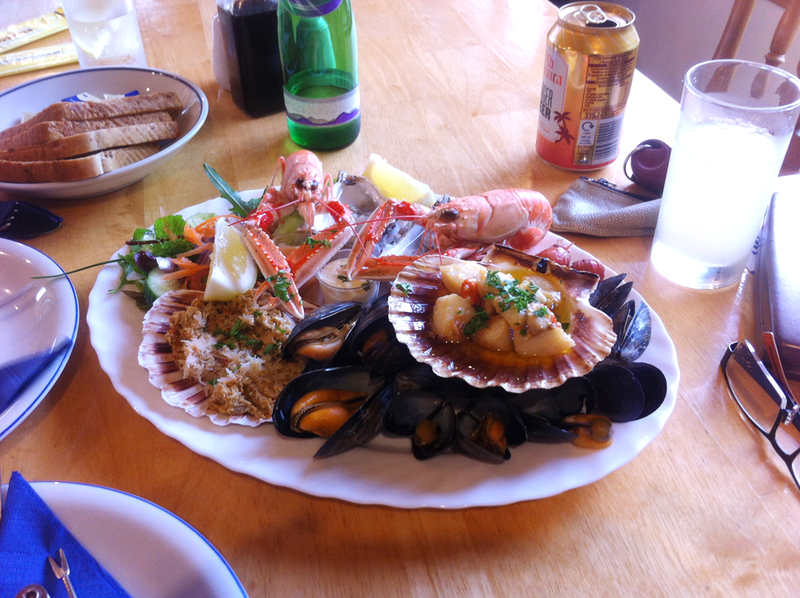 We pulled over on the A896 over about 15 minutes later for lunch at the Kishorn Seafood Bar. This is one of those memorable foody moments that will stay with me forever. I’ll always think of that exhilarating, nerve jangling drive now with the fantastic reviving food we had at the end of it. If you do the 500 you must stop here and try it (that’s if you like seafood). We shared a mixed seafood platter to die for. Well refreshed we continued on, planning to reach the Muir of Ord which would complete our tour of the NC 500. We came across Lochcarron which looked a place well worth visiting again at some point in the future. The road (which now seemed like a motorway) took us down a massive glen carved out by the ice age towards our final destination. One final thing to do before the muir of Ord and the finish line – visit another distillery. Because the Glen Ord distillery was so close to our finish line we called in to buy a bottle to celebrate the finishing of the 500 tour. In comparison to our recent days the countryside was now much greener and verdant, none of the peaty bogs and rough boulder strewn land we had grown accustomed to. It almost felt like a different country, like a culture shock a new beginning, which of course it was. Although the 500 tour was nearly over it really is the start of something new, just what we have yet to find out, but boy I can’t wait for what the future holds for us. We won’t be hanging up the writing just yet as we have a couple of more nights before heading home so we will write a conclusion to this wonderful event in our lives. Janette says she wants to go around again, NOW! 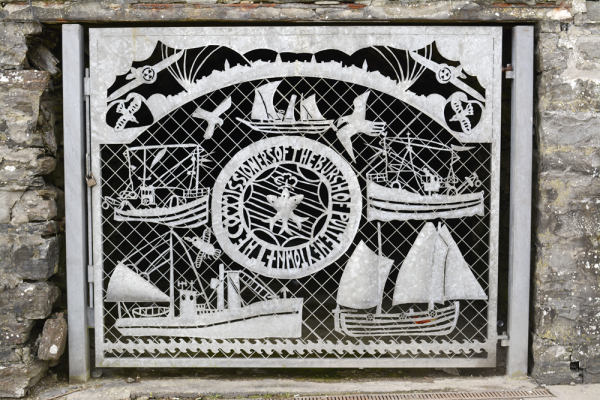 We feel privileged to have shared this with all others on the tour and anyone that comes across this blog, we hope you find it interesting and of value. And please, please do try the Applecross route, but perhaps leave it until the end like we did (unless of course you are a seasoned mountain motorhome driver). And what a way to finish!! 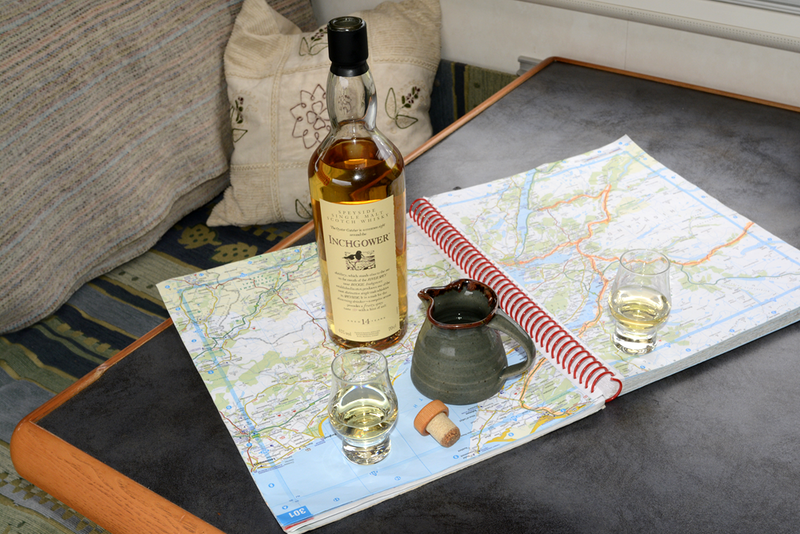 This entry was posted in North Coast 500, Our 2nd year, Travels in Hilma and tagged Applecross, BBC2, Coulin Estate, Distillery, Glen Ord distillery, Kinlochewe Hotel, Lochcarron, Monty Hall, Muir of Ord, Oban Distillery, seafood reastaurant on May 24, 2017 by studio1901. Didn’t plan a long drive today as we knew we were going to visit Inverewe Gardens owned by The Scottish National Trust, which would take up a few hours. What a delightful garden, particularly this time of year the Rhodedendrons were at their best. 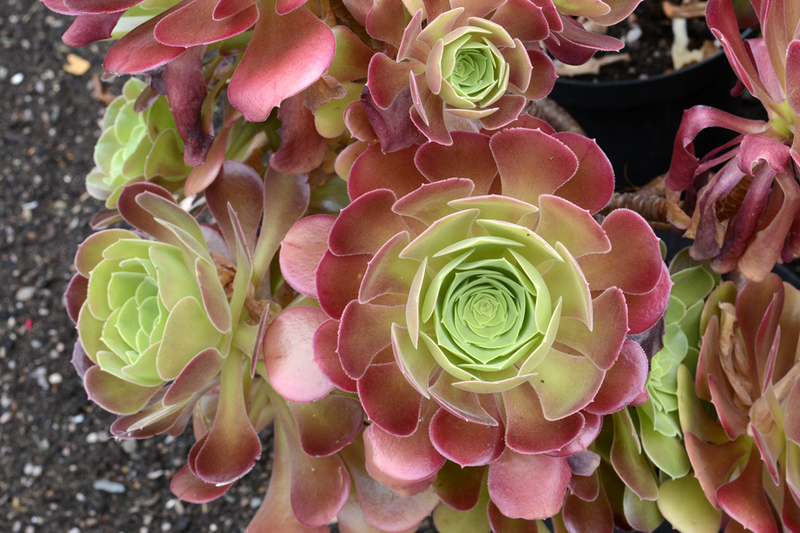 Although I’m sure there is plenty to see all through the main flowering season. 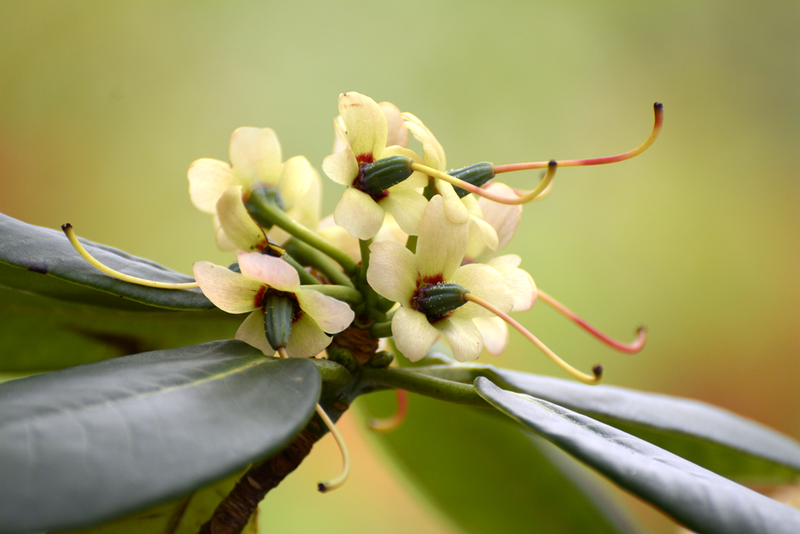 The garden is sheltered from the ravages of the sea by mature trees and benefits from the relative warmth of the gulf stream, a plantsman’s paradise. The main house which burned down was re-built in 1937 and has been restored sympathetically of the same era. Walking around the small house the exhibits were marked in a contemporary and informative manner – a really refreshing way to show off the house and its history, something for all ages. After the garden we went to the CC site at Kinlochewe (we had booked ahead a couple of days ago) to replenish water and get rid of other non-pleasant water stuff. The more I think about it the idea of an extra toilet cassette would perhaps be one of our future purchases in order to extend our wild camping opportunities. My guess though is in France (when we eventually get there later this year) an extra cassette would not be necessary as they are all set up for black water disposal having many Aires (someone correct me if I’m wrong as we are fairly new to all this). Checked out the weather on the notice board and the mountain forecast was for a bright morning with rain later. It was decided then, off we tootled on our bikes down a glen following the river Abhainn Bruachaig (no idea – don’t ask, you’ll have to learn Gaelic). 5 miles later we reached the end of the track (although it did continues as a footpath) at a derelict cottage, just how these people survived the harshness of the environment and scraped a living is beyond us in our modern, comfortable homes. Even Hilma is better equipped than these old cottages were. 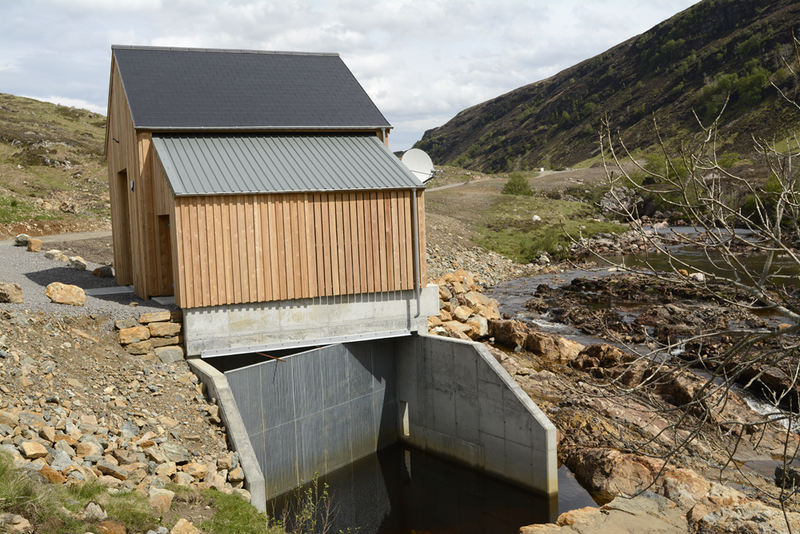 The river has a small hydro-electric scheme being built with 5 individual stations along it. When finished (this year sometime) they will produce 2.4 MW of electricity supplying some 2500 homes for more than 50 years. The whole project seems to have been done sympathetically with the environment being high on the priority list – lets have more I say. Cycling back in sunshine the water glistening, totally alone it was one of those reflective moments again, totally humbling in such a beautiful environment. We got back just as the rain started and booked a meal in the Kinlochewe Hotel and glad we did. That evening it was absolutely packed. The new owners (David & Karen) have only been open 6 weeks and are putting their mark on it being members the ‘slow food’ movement (no microwaves, no deep fat fryers). I had the venison stew and Janette had the smoked fish platter – yum, yum, thumbs up from both of us. Be sure to book if you want a meal as during the main season this will get busy. Oh, I nearly forgot, they have 75 single malt whiskies for you to try (we managed 3 and stumbled back to Hilma). 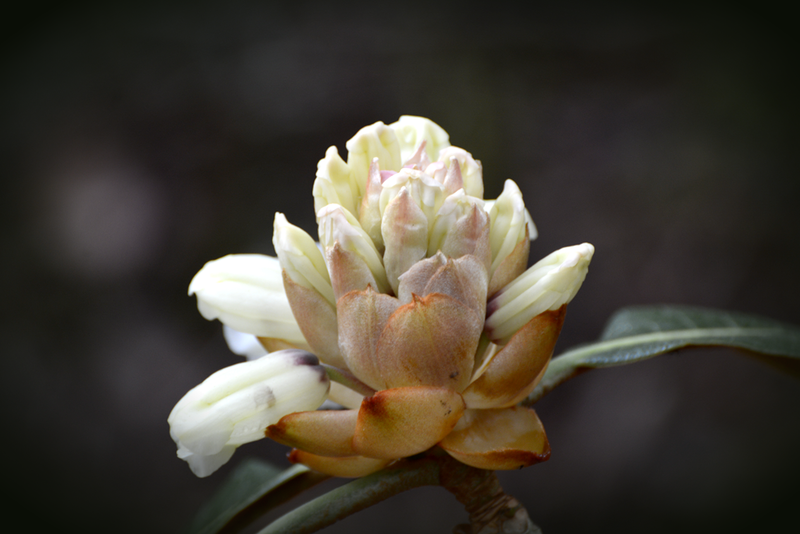 This entry was posted in North Coast 500, Our 2nd year, Travels in Hilma and tagged cycling scotland, hydro-electric, Inverewe Gardens, Kinlochewe, Lochinewe, Rhodedendrons, Scottish National Trust on May 24, 2017 by studio1901. I’m writing this in the Kinlochewe Hotel (great meals) 3 days later as there has been no internet to speak of on the west coast. Speed is slow as everyone in the hotel is probably using the same free (secure) wi-fi so I’ll upload most of the photos at a later date. Resuming our journey we left Tarbet early at 8:30am (early for us) by which time 2 vehicles were already parking up for the first boat to Handa Island. 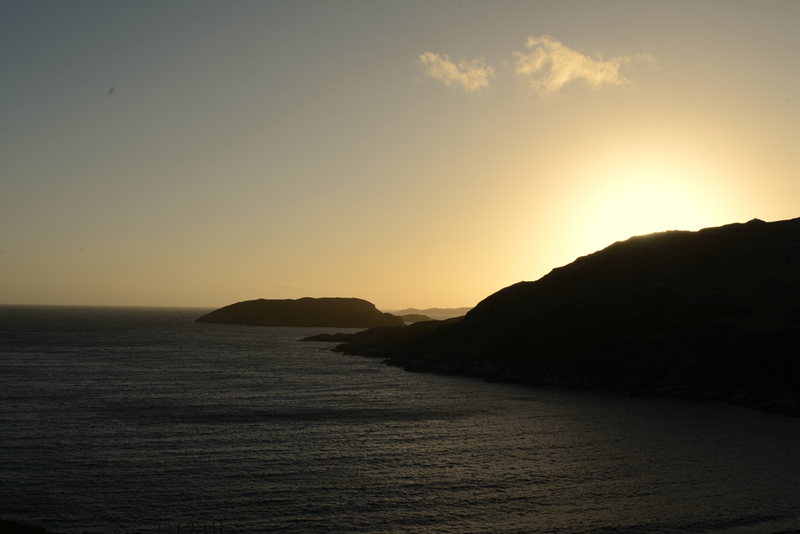 Now we truly are on the West side of Scotland – the views just keep flowing into the eyes and on into the memory. The problem is the memory banks just can’t keep up, our brains need some faster processors and more RAM – if only! We eventually drove past our original wild camp destination and we were not disappointed that we had stayed in Tarbet. 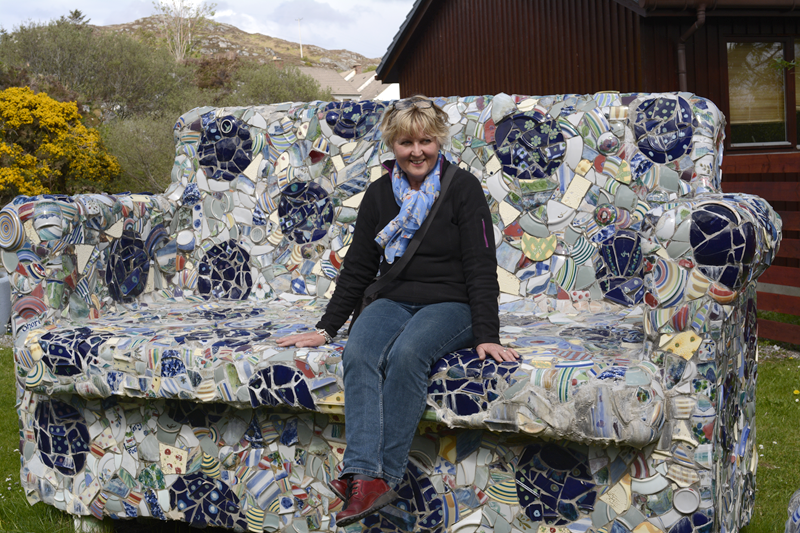 A little en-route side step into Lochinver found us spending money at the Scottish Stoneware Pottery. A rather incongruous site greeted us, a car covered in pottery mosaic with a wild (more like tame) deer scoffing on the local foliage. Getting to Lochinver was an interesting experience – the road via Drumbeg was narrow, nothing new there, but this road was very narrow and very steep, in places marked as 25%. Hilma handled them hills like a good ‘un, her clutch (not crutch) smelt a bit hot when we arrived at Drumbeg for the obligatory ice cream stop. After our ice cream my nerves had been restored to something like normal and off we shot for some more visual indigestion. 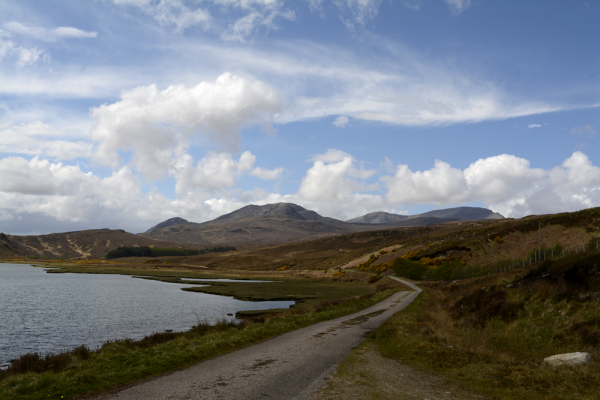 From Lochinver returning to the main route the road runs alongside Loch Assynt and it feels like one is in a truly wild place (‘feels like’ is the wrong description – you ARE in a truly wild place) – a huge glen carved out from the ice age – truly humbling. Having been on the road (some of which was quite testing) for a few hours now it was time to find our next wild camp spot – yes folks – we are getting the bug for loneliness (sad old geysers that we are). We thought we liked small CL site (5 vans max), actually we still do but wild camping is something new to us, very different, the solitude and peace steeps into your pores and we are loving it. Not sure how many places in England you can do this with such ease. 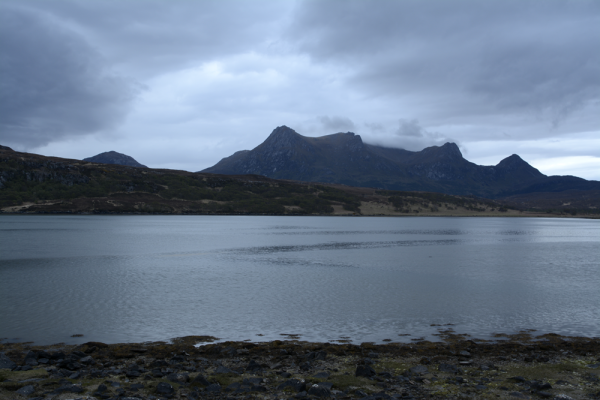 The Coigach peninsula looked inviting so we went off piste, turned at Drumrunie, drove 3 miles and found a loch side stop. (N58.01 324, W.5.10 158) looking up at Stac Pollaidh 2 miles away – all alone again, happy we were. The road actually turned out to be busy, when I say busy I don’t mean London busy I mean Scotland single track road busy. It is the only road on and off the peninsula but all quietened down by the evening and the last vehicle passed by about 9:00pm. Time here has a different feeling, how can time have a ‘feeling’? The only way to describe it is by linking it to the daylight – 9:00pm here is like 7:00pm at home – really, when we drop the bed down at 10:30 – 11:00pm you could still read a book outside. We only travelled 10 miles today! 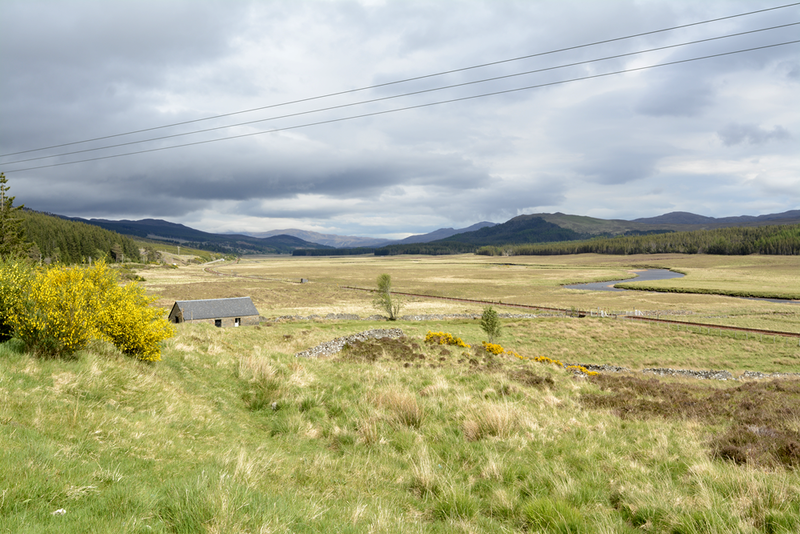 Continuing along the road to Altandhu we passed 4 lochs – plenty of wild camping spots along this road (at least 8 but I reckon we had the best last night – see photos) which eventually reaches a T junction at Enard Bay. Turn left or right and it brings you back in a large loop – we turned right and found ourselves a few minutes later looking out at the Summer Isles. We put our feet down for the night at a campsite (no bookings) – excellent facilities but a tad busy. The reason it was so busy would become obvious to us tomorrow. This peninsula is definitely somewhere we will re-visit at a future date. Diverting from the tour for a minute or two – the reason some of these days are all grouped on one blog page is the good old t’internet or lack thereof on the west coast is hampering daily uploads. To date the Mi-Fi unit installed last month has done a great job and to be honest still is. The poor little fella can’t help it if the rest of the world decides the west coast of Scotland doesn’t need the coverage – short sighted if you ask me. These are exactly the kind of remote communities that would benefit from 3G and 4G coverage more than other places. Other places being cities and large towns that already benefit from cable broadband. I’m currently using a three.co.uk SIM card – 12mths or 12GB and so far over the 3 week period I’ve used 2.2GB, I estimate by the end of the tour we might have reached 3GB usage max. I also have an EE SIM card that I have not tried yet – that has 200MB free and then you top up. 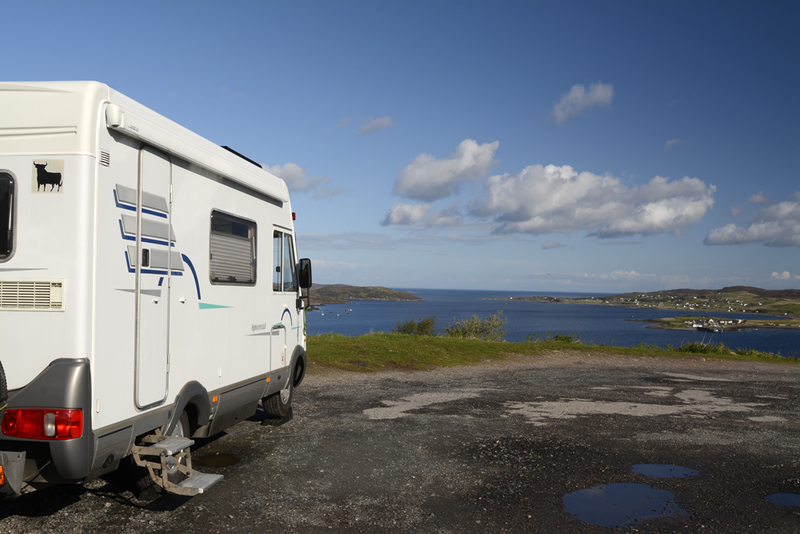 This is all new to me so I’m on a learning curve – some of you old pro’s of motorhome touring may well have the answer to the west coast issue. I’m not on BT hotspots or anything like that and I don’t fancy finding every little café just to log on – we have better things to do with our time (like write this blog in the evening and wait to upload when we can), it is too easy to let the modern day agenda of instant communications dictate our pace of life which I refuse to give in to whilst enjoying this wonderfully peaceful environment and slower paced life in which we are traveling. The weather yesterday evening took a turn for the worse raining cats and dogs, mice, toads and a plague of frogs. Packing up in the morning gloom and drizzle (the frogs had stopped), filling Hilma’s water tank we noticed many of the people on the site had already left. 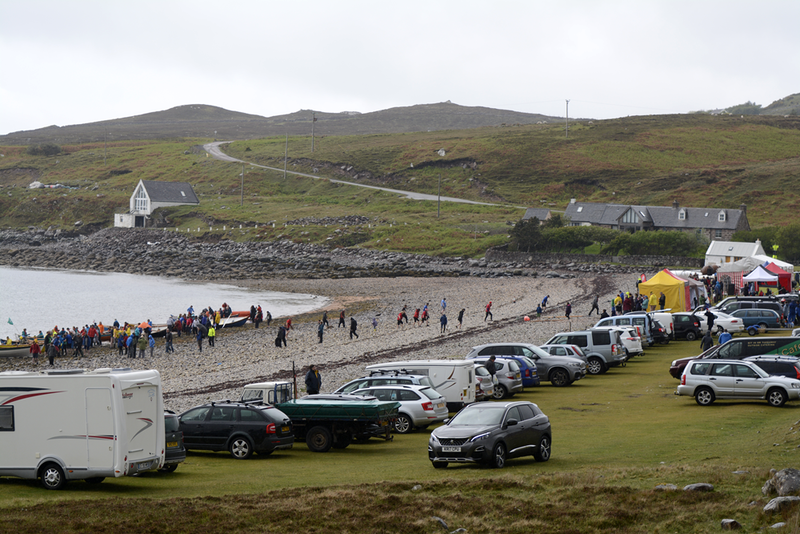 We drove around the loop to get back to the main NC500 route and within 5 minutes we came across Polbain Regatta on the beach, the reason for the packed campsite and mass exodus. Parking Hilma we wandered down to find out ‘the crack’. Villages from all over the west and east coast have their own boat called a ‘Skiff’. 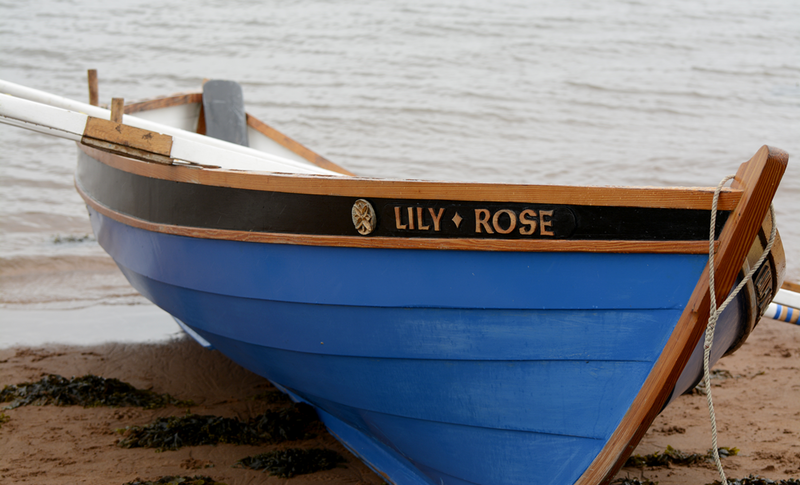 Origination of these boats came surprisingly not from the fishing community but from miners. Because they worked underground they thought up a way of getting out in the fresh air and exercising (pre-telly of course), this then turned into friendly local competitions between the boats. 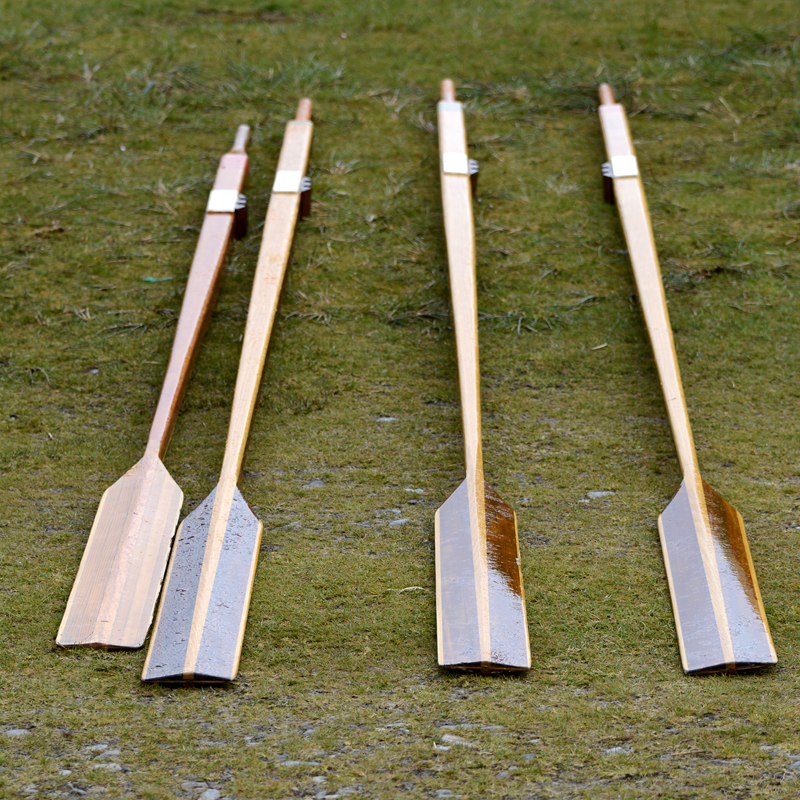 Nowadays it is a way of binding a community together in a common interest, each village wishing to take part has the same boat ‘kit’. 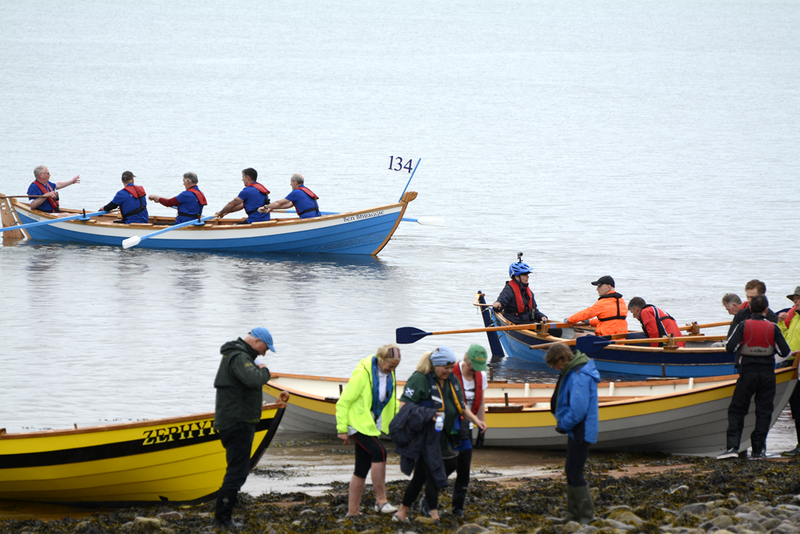 They build it together, train together (different age and gender groups) and compete against other villages in different regatta’s around the North of Scotland. 4 rowers and a cox make up the crew, straight line course, first past the post is the winner, simple (try saying that to a cox!). 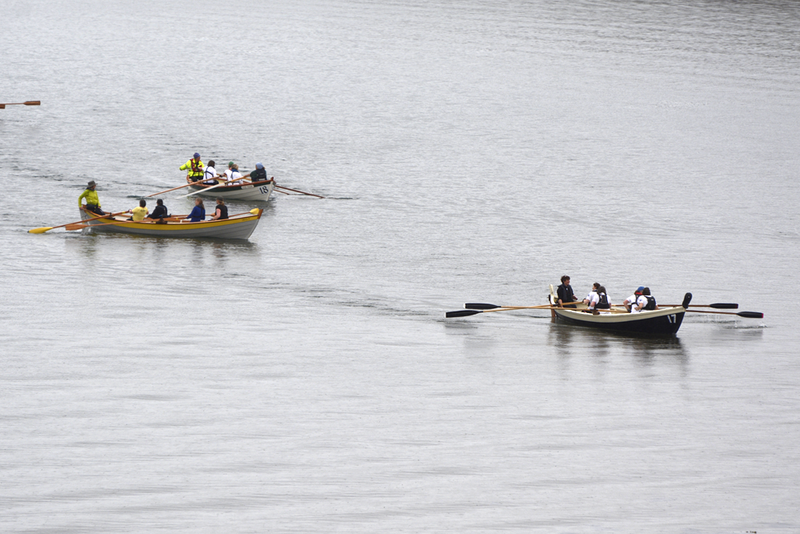 About 16 races take place over the day with about 6-8 boats in each race depending age & gender category etc. Eventually dragged ourselves away despite being invited to the ‘hooly’ afterwards in the village hall – if we had done that we would never have finished the tour for sure! Off we pop towards our next wild camp somewhere near Aultbea or Drumchork on Loch Ewe (we weren’t sure at this stage) – we have a couple of nights later booked at a CC site so want to make the most of finding another good wild spot. We stopped at Ullapool and what a disappointment, we had lunch in Tesco car park and quickly moved on eventually arriving at Aultbea. 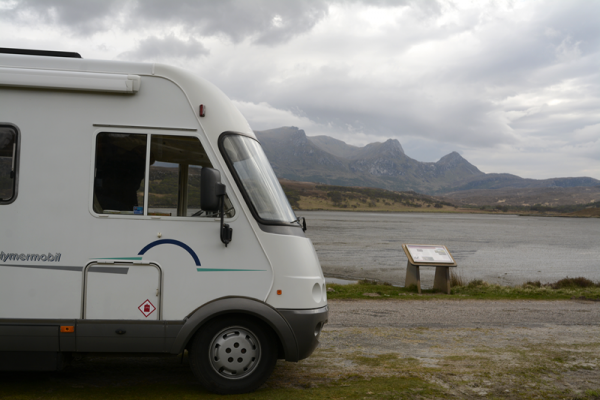 We did find a lovely spot next to Loch Ewe but there was a sign saying no overnight parking. Frankly one has to respect such a sign when there is so much free parking around. We drove down to Mellon Charles back out of Aultbea, wound up the tour route to a fantastic high viewpoint overlooking Loch Ewe (57°49.525’N, 5°34.615’W). Plenty of information boards around this area pointing to the fact that Loch Ewe was used during WWII to shelter the North Atlantic Russian Convoys, even today just below where we parked there is a NATO refuelling station (I’ll probably get arrested now for putting that on the blog! ), if you don’t hear anything for 10 years I’m in the brig! Contrasting weather, went to bed in a downpour, woke up to glorious sunshine (see pics). This entry was posted in North Coast 500, Our 2nd year, Travels in Hilma and tagged Altandhu, Clynelish, Distillery, Drumbeg, Handa Island, Kinlochewe, Loch Ewe, Lochinver, Mi-Fi, Polbain, Regatta, Skiff racing, Stac Pollaidh, Tarbet on May 22, 2017 by studio1901. We left Rispond having first taken our cups of coffee down to the beach. We decided it would be a good idea to have a paddle, leaving our shoes, socks and empty coffee cups by the steps off we tiptoed to dip our toes in the North Atlantic. We were right, bloody cold, when our feet eventually came out they were a very pale white, verging on blue. Back on the road we briefly stopped at Durness for provisions and fuel (24hr pumps with card payment system). 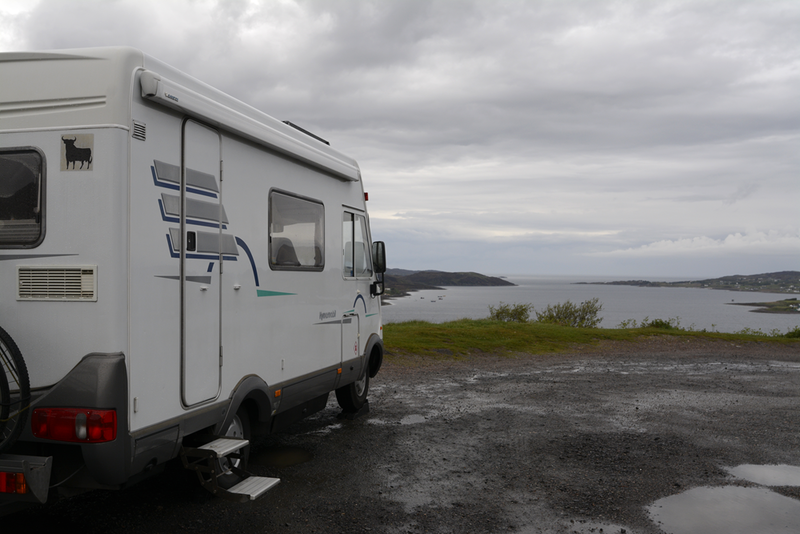 Our next destination was a small CL site (Caravan Club – Certified Location – 5 vans only) at Kinlochbervie, no advanced booking, just turn up. The number of motorhomes and campers we were passing we began to wonder just how many other people were on ‘the tour’ like us. The Scottish Tourist Board have done a great job of marketing the NC 500, one wonders if there will eventually be an ‘exhaustion point’ – just too many people for the existing facilities (especially those wild camping). 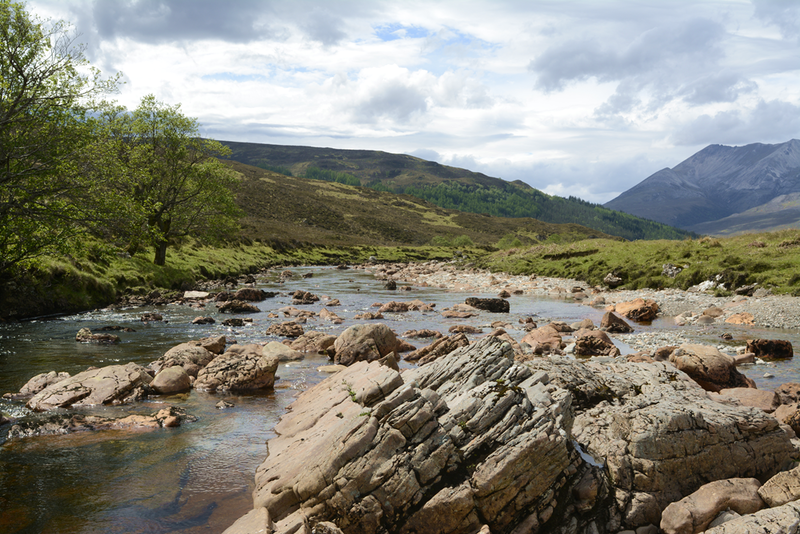 It seems that there does need to be more facilities for getting rid of black water, especially as wild camping in Scotland is so easy (and beautiful). 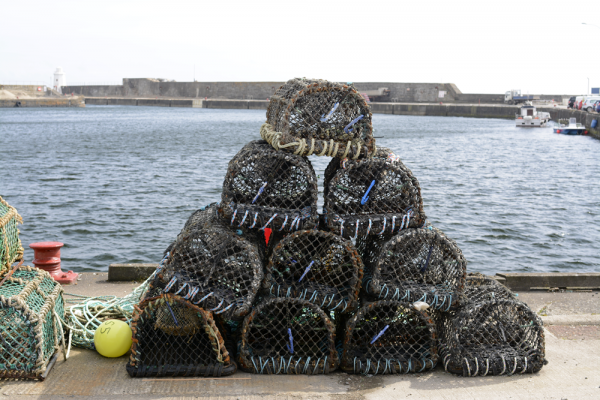 Having said that at Kinlochbervie there are 5 spaces on the Old Harbour with hook up and waste disposal for chemical toilets – cost – £15, pay at the local Spar and the money goes back into local community projects. 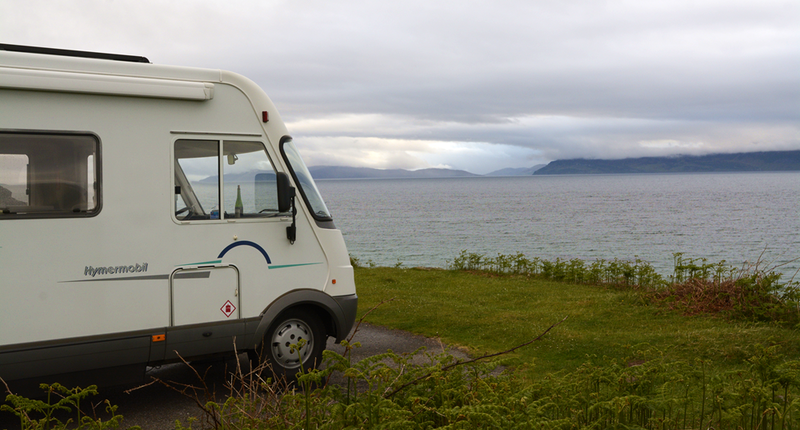 Further down the road at Oldshoremore there were 2 motorhomes parked in a decent size car park (with WC). 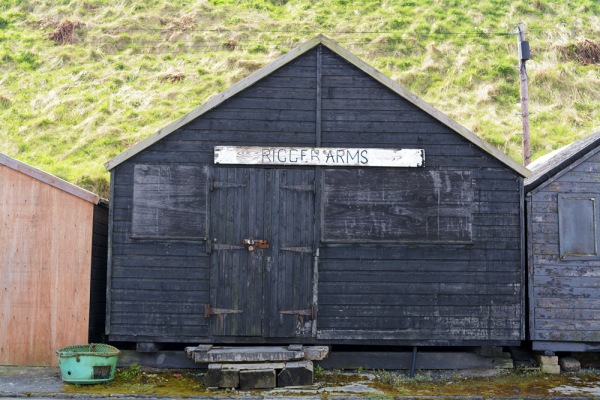 Today (16th May) we had to move to a more sheltered spot on the site (labelled as ‘Storm Refuge’ by the owner) as 42mph winds were forecast – and boy did it blow. Question: At what point does a Hymer B544 tip over in strong winds? Answer: I did not want to find out! 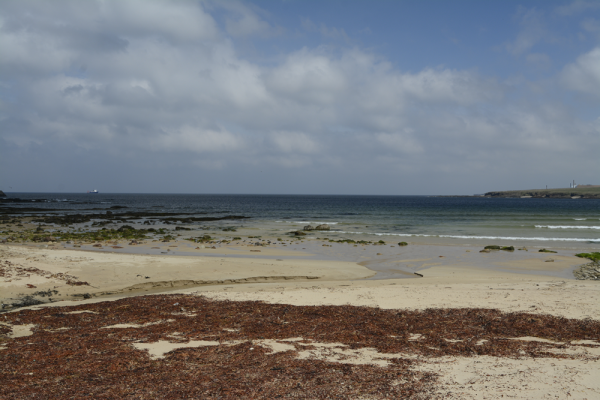 Before all the moving we did manage a cycle down to Oldshoremore Bay – just one more beautiful golden beach. Sandwood Bay is a recommended walk a little further down the road (4 miles from its car park). We would have liked to do that but we were beaten by the weather, on the way back we were almost blown off our bikes so had to walk some of the way pushing them and looking like wimps (chapeau to all the Tour de France riders). Decided to splash out a bit and go out for a meal at the Old School House, 2 miles down the road at Inshegra. They could just squeeze us in at 6:30pm as they had a party of 17 in, lucky us, the food was gorgeous (Langoustines for Janette and Sole Veronique for me). Leaving Kinlochbervie we hoped to make it to Handa Island (Scottish Wildlife Trust) and can only get there by passenger ferry (small rib that takes 12 people max). Arriving at about 11:30am we were astounded by the amount of cars their. We couldn’t park and were eventually guided to park outside someone’s house. If you are going to visit the first boat is 9:00am and last boat out is 2:00pm (weather dependant) and last boat back 5:00pm. 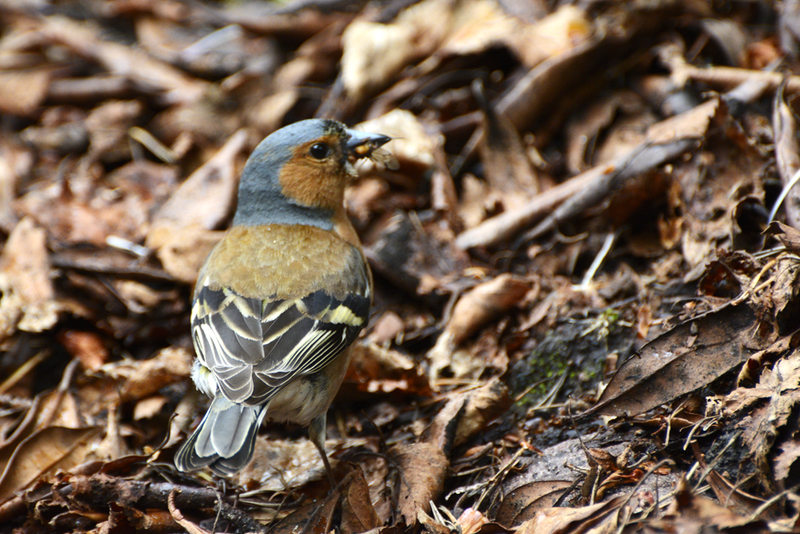 If you are into nature loving in any way at all the £12.50 return fare is well worth it. 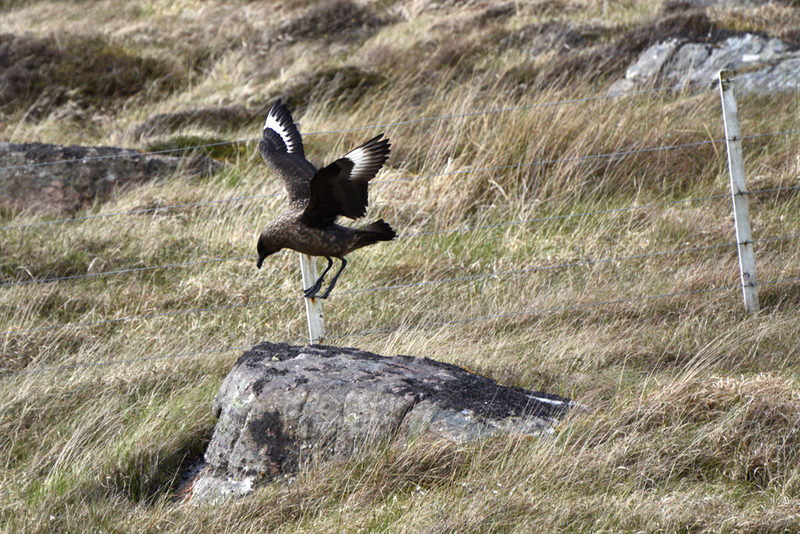 We saw Great Skua’s, Puffins, Terns, an Arctic Skua and many more species. It takes a good 3 hours to walk around so allow plenty of time. Fantastic day out (we caught the last boat back!). As it was now 5:15pm the thought off dragging ourselves another couple of hours (the roads are slow here) to an intended wild camp spot did not seem like fun (we were knackered) we decided to stay here. We moved Hilma down to the harbour vowing to leave early next morning before getting blocked in! There is a lovely restaurant in the harbour www.shorehousetarbet.co.uk – we had a couple of drinks and sitting on the veranda with the sun sinking behind Handa Island life suddenly became a little reflective – but beer does that to you sometimes. The owner (Julian) has been there since his mother started the restaurant and he and his wife Jackie eventually took over. Julian catches all the fish for the restaurant so it couldn’t get much fresher. We later offered Julian a glass of wine from our ‘Hilma Cellar’ as he was so helpful in initially directing us where to park. His philosophy is if he loves it so much then why shouldn’t he help other people to enjoy the same. All that is asked is that you donate some money to the RNLI – absolutely! 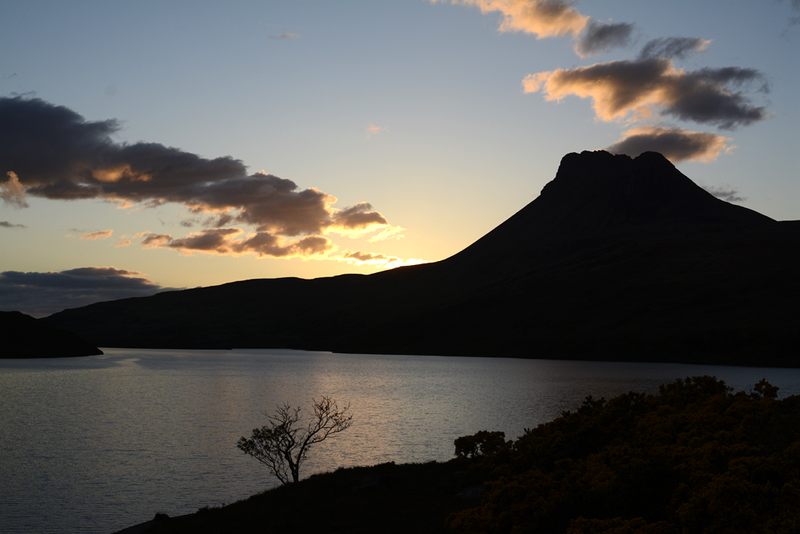 At 9:30pm I decide to go and try and catch a trout in the small Loch Dubh behind the harbour. No initial luck – I then moved location and changed my fly to a ‘Claret Bumble’ (don’t ask) and within a couple of casts I had one on. A beautiful little wild brown trout, red and dark brown spots, I released it to continue his (or her) journey in life – what a treat. Janette disappointed as I didn’t bring one back for breakfast. To finish off the night, 2 pairs of Greylag Geese and eight goslings waddled down to the sea. Don’t miss Tarbet if you’re on the NC 500. 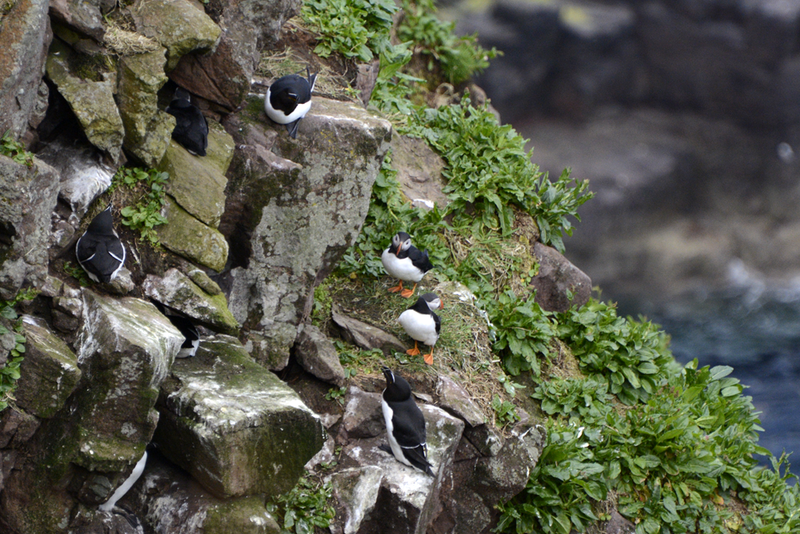 Puffins – how do they manage to cling on? Still, if they fell off all they have to do is flap! 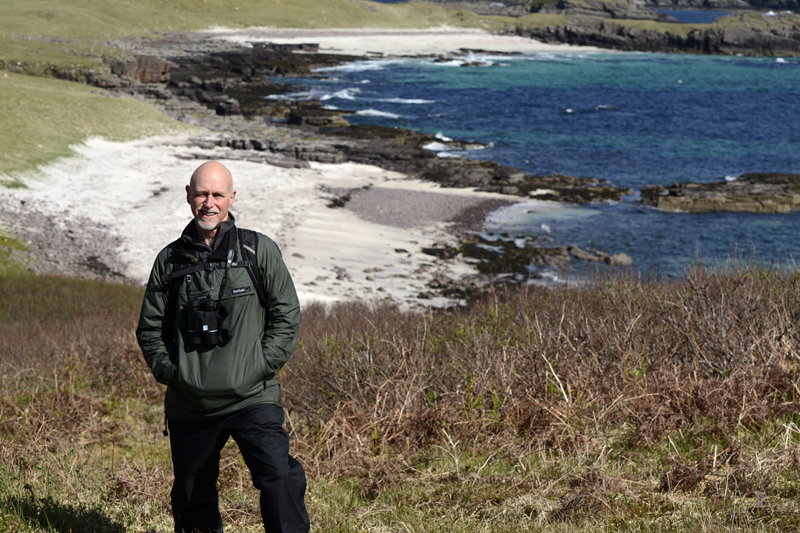 This entry was posted in North Coast 500, Our 2nd year, Travels in Hilma and tagged Arctic Skua, Durness, Great Skua’s, Handa Island, Inshegra, Kinlochbervie, Old School House, Oldshoremore Bay, Puffins, Scotland Wildlife Trust, Scottish Tourist Board, Terns on May 19, 2017 by studio1901. The plan tonight is to do our first wild camp – we have a rough idea where we would like to stay (Kyle of Tongue) but of course until we get there we have no idea if we will be able too. Off we trot again into Thurso to pick up some supplies – after the blown fuse incident I decided I needed one or two more just in case. Fuses bought and postcards posted we make our way past Dounreay Power Station and find a lovely bay (Sandside Bay) with great parking and a WC. 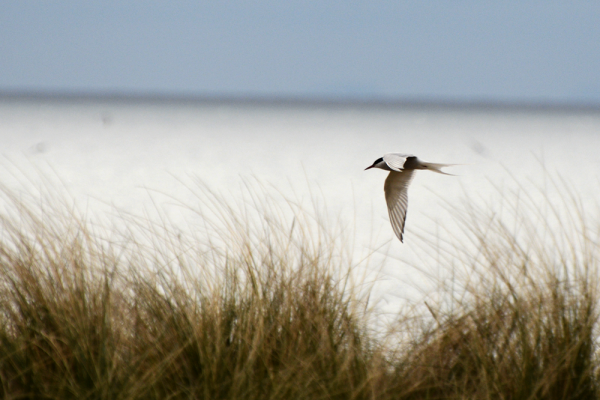 Great walk along the beach with a flock of Ringed Plovers circling out at sea eventually settling on the shore front. On closer inspection we found a lone Dunlin just coming into summer plumage in the middle of them all. Just after exiting the beach we then noticed the signs NOT to pick up any metal objects, shells or pebbles as they might be contaminated with radiation – a quick check of the feet and I noted Janette’s were glowing a little! Onwards towards our evening destination. What we are finding on this mini-tour is that time is of no consequence when there isn’t anything booked. Very calming, good for the soul. The scenery up here is breath taking, almost too much visual indigestion to appreciate it – but appreciate it we do. En-route we pass (or rather they pass us) at least 6 Ferrari’s we guess were doing the tour, Hilma tried to keep up but had to admit defeat despite having the larger engine! We eventually arrived at Tongue, over the causeway and took the Achuvoldrach side of the road and headed down the side of the Kyle of Tongue. Nerve wrackingly narrow road with occasional passing places, wide enough for Hilma but you wouldn’t want to get a wheel off the edge – bog, bog, bog. About 2 miles down the road we pulled in to a parking spot where there was already a motorhome – we thought we should ask if they minded us staying – we were thinking safety in numbers as this was our first wild camp. All was well and to be honest it was probably one of the safest places in the world! The view was incredible (see pics) and there was complete silence apart from the call of the birds. After a very peaceful nights sleep in one of the most secluded spots I have ever been too. I was finding it hard to contemplate moving on, this was such a perfect spot and really moved me to the core. I’m not advocating everybody should up sticks and do the North Coast 500 but certainly find some wild places to stay for one or two nights and it really makes you appreciate our green and pleasant land (or in this case brown and pleasant land). But tear ourselves away did after a little walk down the road to take in the wonder of where we were (on the planet and the universe), we were able to drive all the way around the Kyle of Tongue before eventually emerging back onto the A838 and onward to our next wild camp. We drove across acres of ‘flow country’ passing a few clearance villages with Scandanavian sounding names, onward through a place called ‘Hope’ (which you would have needed plenty of to live there) and onto Loch Eriboll. The road now continues all the way around the loch (single track with passing places), a loch which is so deep the Royal Navy anchor ships when the weather takes a turn for the worse. You cannot do this quickly, every few minutes you will come across another motorhome, motorbike, car or van which you (or they) pull over to let each other pass. When we arrived at our intended spot to camp we were not disappointed, our jaws dropped open at what must be the best view on the tour (so far). 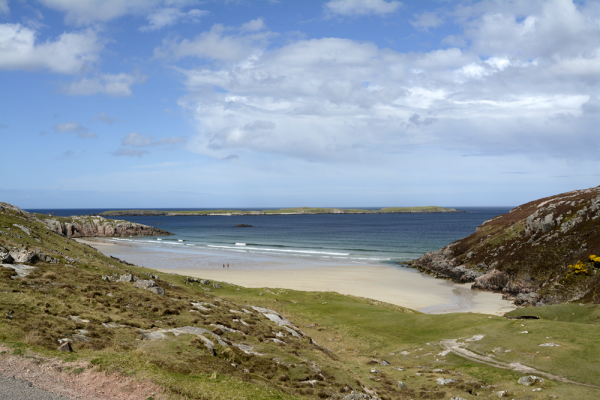 The lay-by we were stopping in overlooked Traigh Allt Chailgeag bay – 3.8 miles from Durness. Parked up and immediately went down for a wander on the beach – who needs the Carribean when you have beaches like this here (well the temperature would be better there). Gannets were flying high and then plummeting into the sea like huge white darts hitting a bulls eye in the North Sea. Terns were also feeding with much more elegance and delicacy, there must have been a wonderful feast of fish and sandeels in one hotspot seafood café for birds. Had a chat with someone who was taking a month off work camping around North Scotland. He had an old Range Rover with a collapsible boat and 6hp engine on the roof rack, all his cooking gear on the drop down tailgate and some conversion of the seats if he needed to sleep inside. He had just come from the Shetlands which I think is about 140 miles north again – now that is what I would consider hard work – not him. In the evening we walked around a local heritage trail covering the clearances near Durness in 1842 – very, very interesting. Makes one think about all the instances still continuing in the world where minority groups are persecuted. Mankind has a lot to answer for. My philosophical outlook though does nothing to dampen the beauty of this place, it is well worth visiting even if you don’t stop here. This entry was posted in North Coast 500, Our 2nd year, Travels in Hilma and tagged Dounreay, Dunlin, Durness, flow country, Gannet, Kyle of Tongue, Ringed Plover, Sandside Bay, Scottish clearances, Thurso, Wild camp on May 15, 2017 by studio1901. 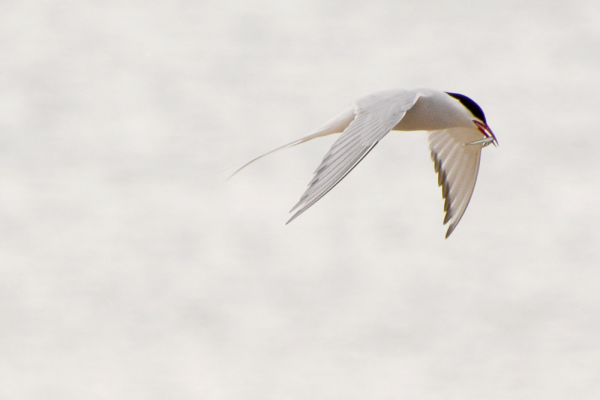 Janette and I went off early to take a look at the Terns – they turned out to be Arctic Terns performing some lovely ‘floaty’ type aerobatics. Didn’t hang around or get too close as we did not want to disturb them. Went to the shops on the bike this morning – why is it (despite having a list provided by Janette) I always end up buying more? Always happens. In this case my excuse was ‘when confronted with a local baker’s shop full of lovely cream cakes I really do think (especially on holiday) one should give in to temptation and support the local economy’. Whilst I was out purchasing said ‘necessary’ cakes Janette was being much more sensible and buying Halibut for supper off the fish man who visits the site regularly. Late morning we take off on the bikes and planned to cycle around Loch Brora – as we passed Clynelish Distillery that old devil temptation kicked in again – and we were only 15mins into the ride. We had quick chat with a lovely lady in the ‘tasting room’ and decided it would be better to do some ‘tasting’ on the way back! Good decision! 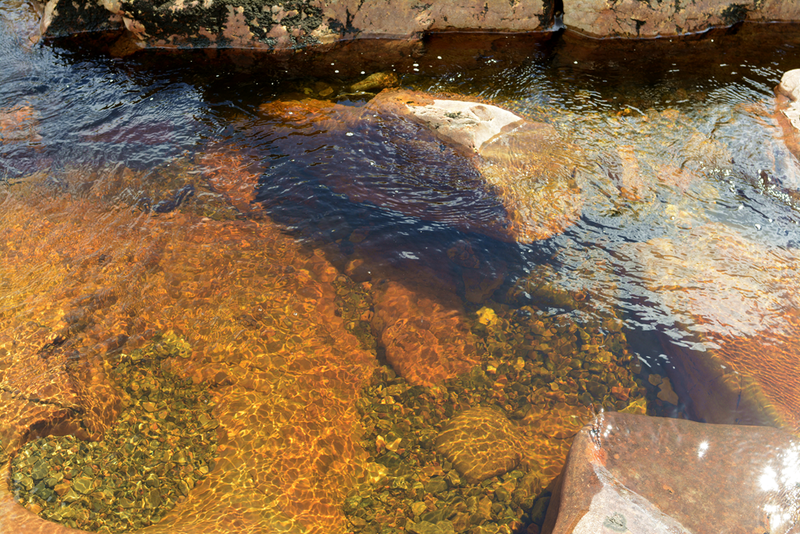 Stopped for lunch at Doll Ford Bridge – what a glorious spot, off the beaten track and only 30mins from the CC site at Brora. 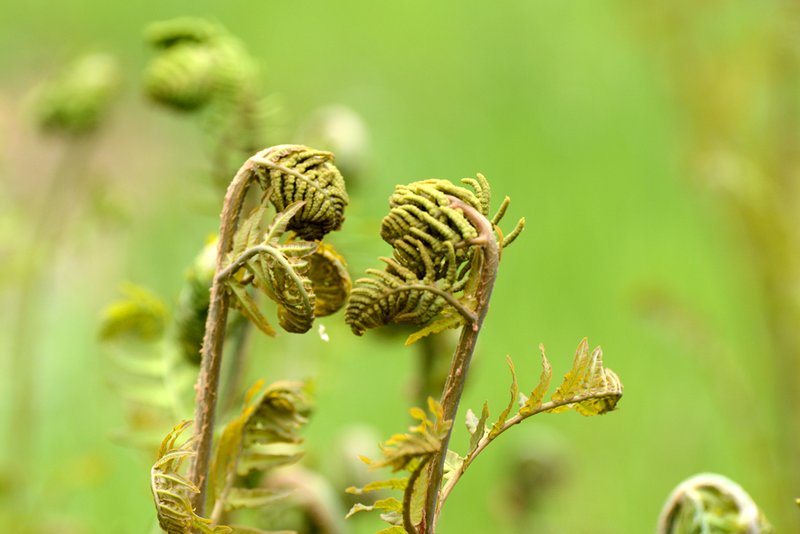 Dippers, Sandpipers and trout rising to a Mayfly hatch – sounds idyllic – well, yes it was! Continuing along the side of the loch we eventually came unstuck with our plan to cycle all the way round – the track stopped at a farm despite being shown on an OS map as going all the way round. Back we went and cycled up the other side instead keeping the time in mind as we didn’t want to miss our appointment at the distillery! Taste we did and didn’t fall off. I rang my friend Peter as he wanted a bottle of Clynelish, his answer machine was on so I left a message that I had purchased a 35yr old malt for £1,200 rather than the 38yr old at £1,450. He quickly rang me back to cancel and go for a £43 bottle instead! Ha! Back on the road after 3 nights at Brora which we thoroughly enjoyed. 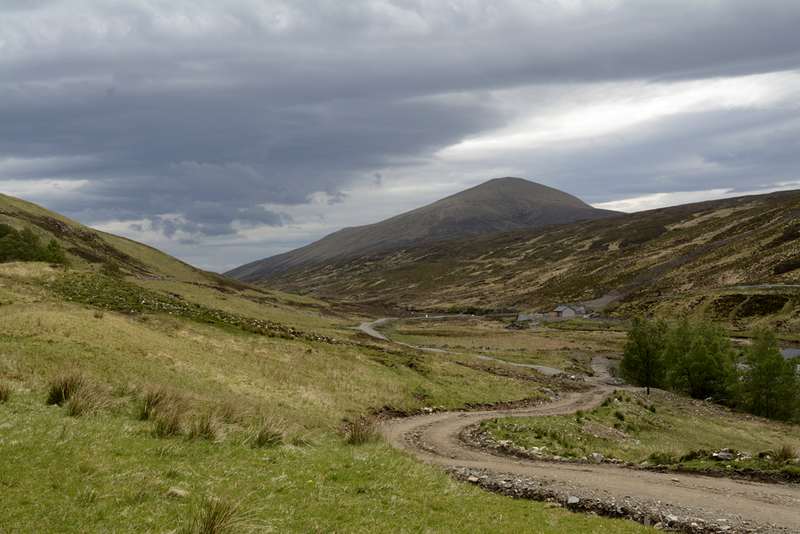 Amazing drive from Brora to Wick – some of it very winding and steep. 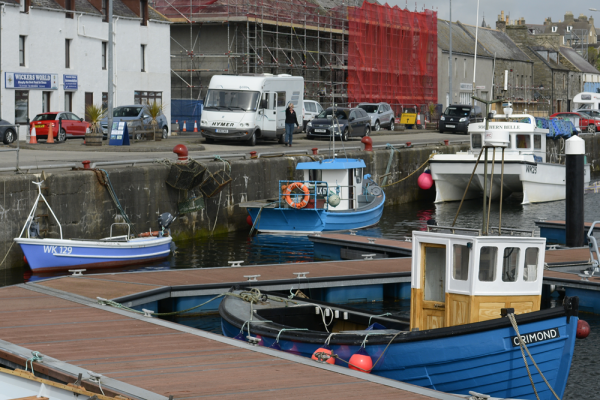 Drove down to Wick Harbour rather than into town, parked Hilma up had a wander, back to Hilma for a coffee and then off again to Tesco for provisions as apparently (according to Janette) the cream cakes I bought would not last us another week. 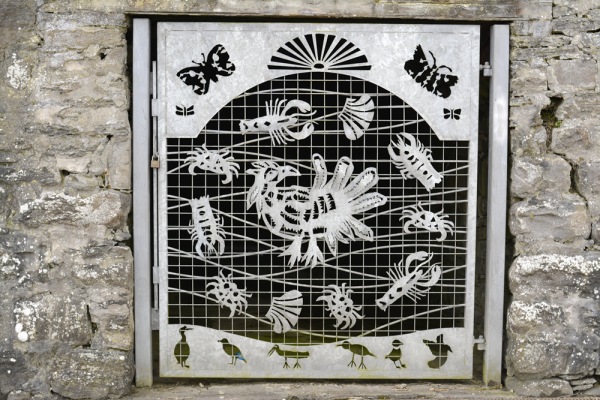 Some amazing metalwork gates (7 in all) installed in 2006 reflecting, in art, the culture and history of the area can be found covering old holes in the wall at one end of the harbour. A real gritty working harbour with great character. 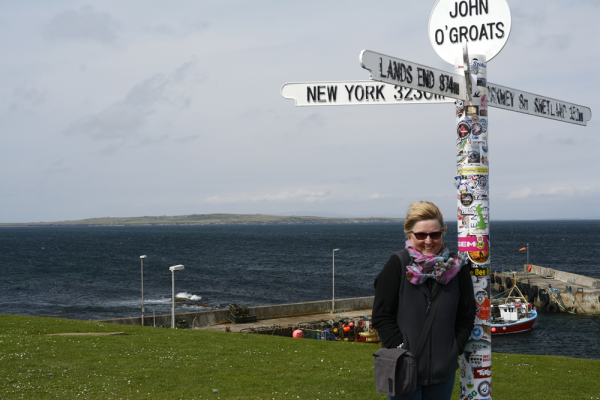 On to John O’Groats – well some people must like it! 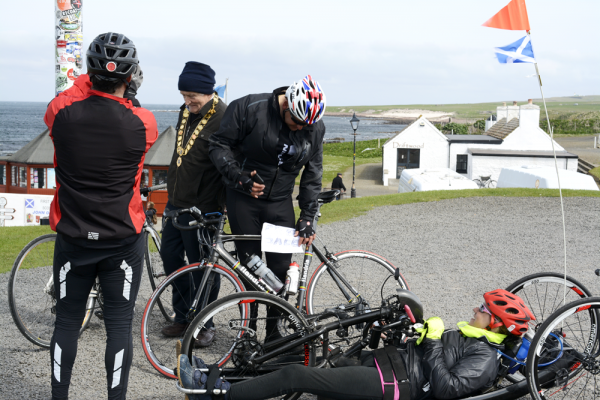 Highlight of the day though was an amazing lady who had lost the use of her legs and using a special bike cycled from Land’s End to John O’Groats, taking 10 days 8hrs and 4mins, raising £18,000 for Cancer Research. The obligatory John O’Groats snap and Janette looking cold – it was! Stroma Island in the background. Every self respecting motorhome should have something from this window (NOT). 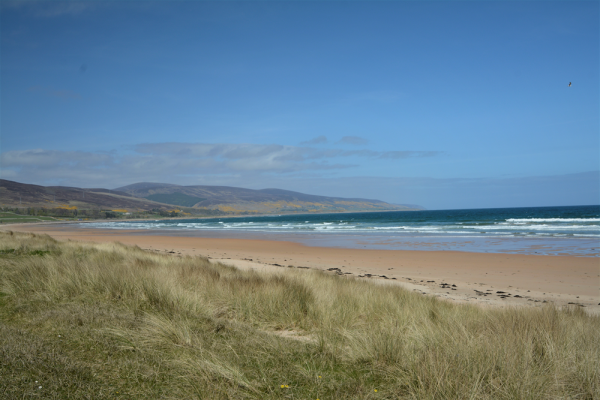 Drove on to our destination for the night at Dunnet Bay – stunning views of a 2 mile golden sands beach. Amazed it has not rained once yet – very, very windy though. 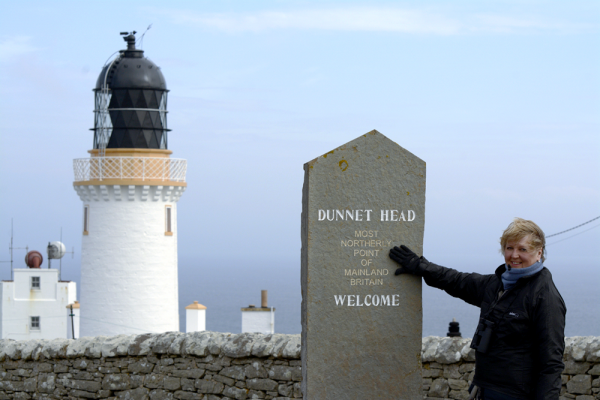 We had planned to cycle to Dunnet Head today but the wind was so strong I do not think we would have enjoyed it (or even got there!). 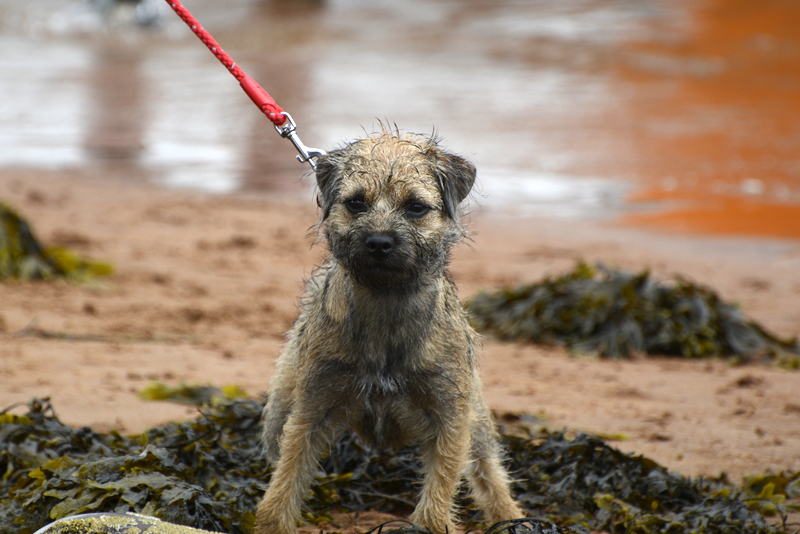 So off we went in Hilma up to the most northerly point of mainland Britain. The RSPB ‘shed’ was closed and just to proves how strong the winds get here the roof was ‘roped down’ for good measure. Did the touristy bit and wandered around reading all information boards. The area was used as a look out point as during WWII the Royal Navy had part of it’s fleet anchored in Scapa Flow within the Orkney Islands which can easily be seen on a clear(ish) day. Is it still used as a Royal Navy base I wonder? 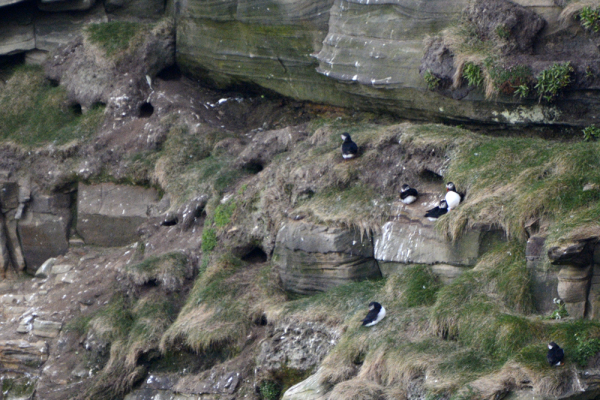 We then went off ‘birding’, hoping to see our first ever Puffins – we were not disappointed, there sat 6 of them outside their burrows on the cliff side. I’m sure there were more of them out at sea gathering food for an evening snack of sand eels, yum. 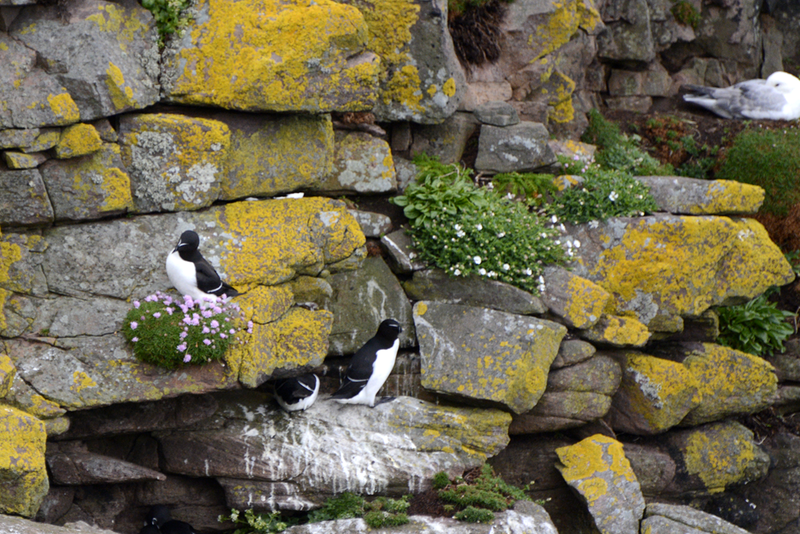 Later took the telescope to the cliff edge to spot what the ‘rafts’ of birds were out to sea – mainly Razorbills and Gulls. By far the most majestic birds out there were the Gannets, flying close to the sea one minute and then finding a thermal and soaring like gliders up, up and away before returning to do the same. 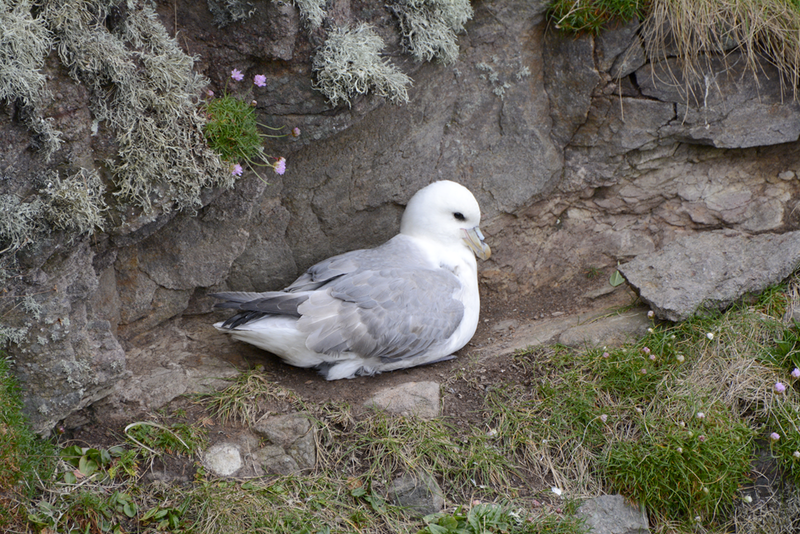 Close in were Guillemot, Kittiwake the amazing Fulmar (looked like juveniles – possibly last years? – still quite speckled on their wings) performing their wonderful acrobatic flights so close in to the cliffs. Late on in the day we saw a huge bird which ended up being Giant Skua – mobbing and dwarfing the smaller gulls and birds around it, almost with ‘hawk’ like dives now and then. Ended up spending all day at Dunnet Head because it was such a magical place despite being blown about by the strong winds. Will do again at some point I’m sure. On the way back stopped at a passing place to look at a fishing notice, put the emergency flashers on and when came to start off again Hilma refused to start up again. Not just that, the injector light that had caused me so much angst before the holiday was on again. Janette calmed my jangled nerves and we checked the fuses, sure enough a 10A fuse had blown on the emergency flasher slot. 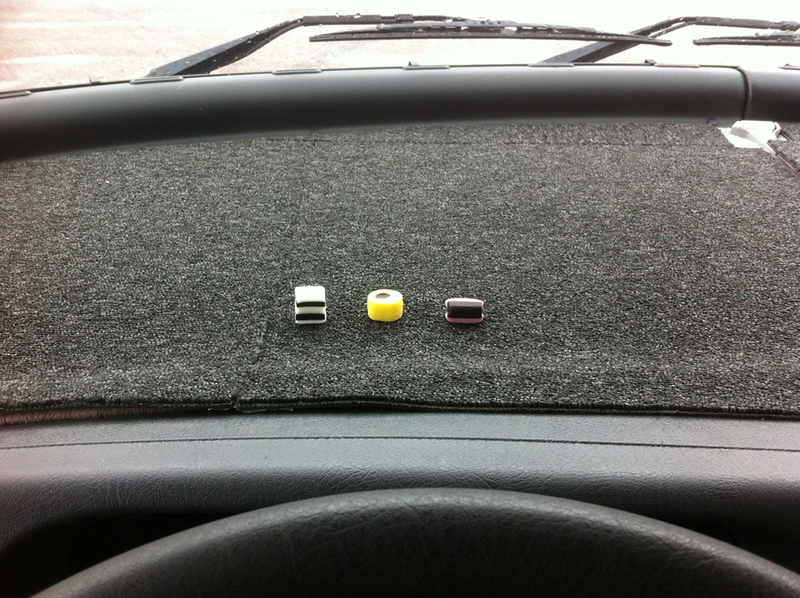 Replaced (yes folks – keep loads of fuses with you) it with another and Hilma started like the good girl I know she is. However that damned light was on again, but knowing the history I am a little more comforted knowing what has caused it to come on. When we got back to the camp site I checked out the manual (all in German so had to do some google translating – yes the MiFi unit installed was working fine) and it turned out there should be a 15A fuse in the slot – duly replaced. The only thing now is do I pay another £85 to get the fault cleared off the dashboard? Tomorrow we are off to do our first ‘wild camp’. Not sure where we will stop, we will see when we get there I guess. It will give us a chance to try out the solar panel as so far we have been ‘hooked up’ to the grid. 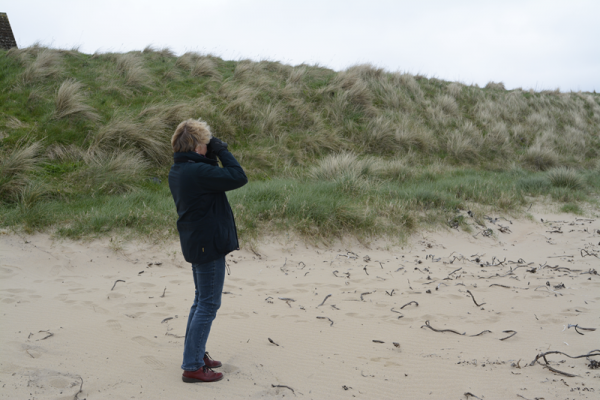 This entry was posted in North Coast 500, Our 2nd year, Travels in Hilma and tagged Arctic Tern, Brora, Clynelish, Distillery, Dunnet Bay, Dunnet Head, Motorhoming, North Coast 500, Orkney, RSPB, Travels, Wick on May 12, 2017 by studio1901. Now we really are on the NC 500 tour! The previous days were all a build up to today. Leaving Inverness the sun was shining once again for the 4th day on the run. Previous holidays in Scotland have also proved a bonus with the weather for us in May or early June. We made a slight detour off the NC 500 (and glad we did). Leaving the busy A9 at the Dornach Firth bridge we took the A386 to Bonar Bridge and returned via the A949 stopping en-route for a lay-by lunch. Much nicer than the A9! The banks around the Dornach Firth are all covered in deep cadmium yellow coloured gorse flowers, which if you tried to paint would look completely out of sorts with the rest of the landscape. We also stopped on the A9 before our destination to take in a wonderful sea view along with the 30 or so Eider ducks all pairing up and ‘cooing’ away gently. 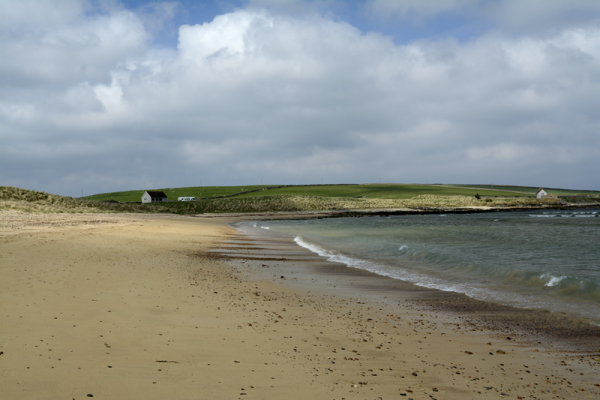 Arriving at Brora CC site early afternoon left us enough time to walk the 1.5 miles back into Brora village along the pristine beach and footpath sandwiched between the sea and a beautifully kept links golf course. Mandatory ice cream at the end – sun still shining and just starting to chill (us and the temperature). Had to put the heating on for the first time (wimps that we are). End of day one and if the rest of the holiday is like this I for one will not be complaining. 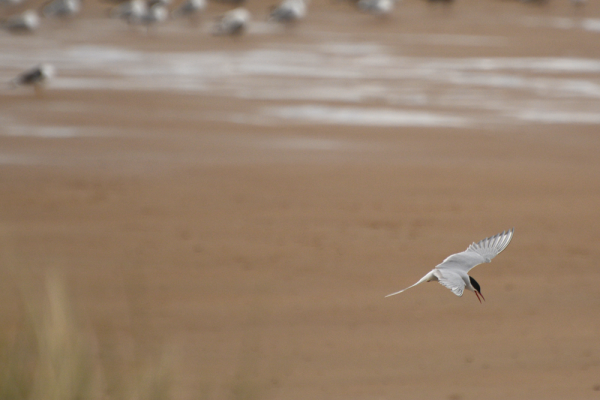 Off for my early morning run again 6:45am – ran along the same coastal path and this time saw at least a dozen Terns (Arctic I think – but Janette and I are planning an early morning foray tomorrow with the binoculars to see if they are Arctic or Common). This morning I had to sort t’internet out for the online shop as it had been down for quite a few days. Not the kind of thing I wanted to be doing on holiday but needs must. We had a few hours spare as we had planned a trip to Forsinard on the train (RSPB reserve) and the train from Brora was not until 1:00pm. T’internet sorted and off we pedal to the station for what turned out to be a most spectacular train journey. Seriously, if anyone is reading this, it has to be done. What a beautiful scenic route along the Helmsdale valley – of course the sunshine and warmth always makes one see it through rose tinted glasses but I seriously think even on a ‘dreek’ day this would be a most marvellous journey. 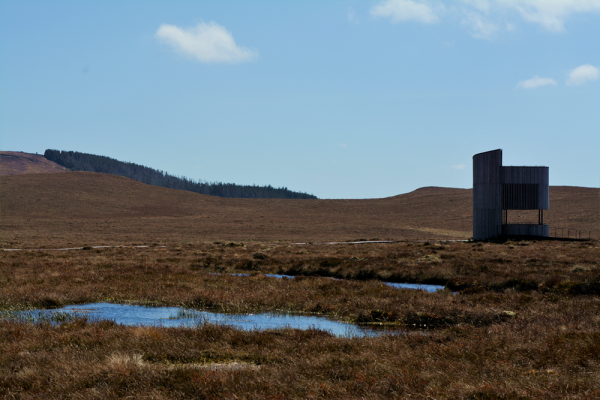 Off we get at Forsinard and are treated by Chris the RSPB warden to an hours walk and talk about the Forsinard Flows – the (and think about this) largest bog/moss area on the Planet, yes, in all the world this is the most important place for carbon absorption. If anyone knows any different let me know! We are talking 400,000+ hectares of boggy area. 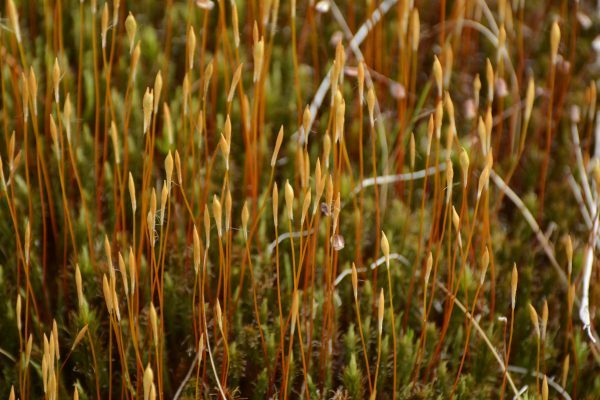 The moss absorbs the gas and because the moss is permanenntly in water it never releases the gas – seriously good for the planet. Not just for Scotland, not just for the UK, not just for Europe, but for EVERYONE – yes all your family – think about that and look into it sometime. 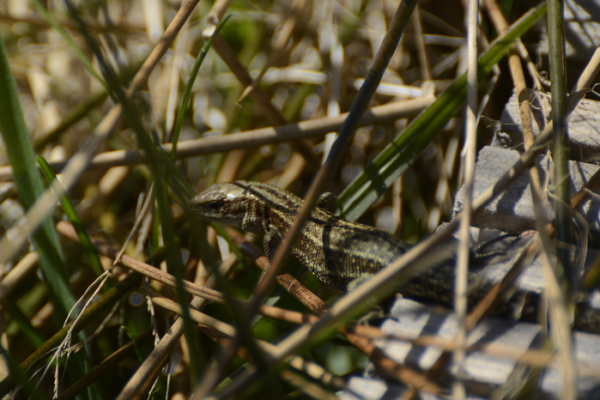 We saw Common Lizards, Stonechats, Wheatears, Whinchats, Meadow Pipits and various ducks and geese – a great day out and then that spectacular journey back – a magic day. 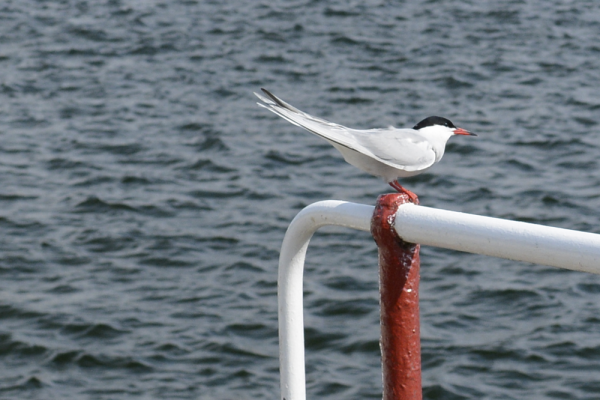 This entry was posted in North Coast 500, Our 2nd year and tagged Arctic Tern, Brora, Dornach Firth, Forsinard, Helmsdale, Inverness, NC 500, RSPB, Scotland on May 9, 2017 by studio1901. And they’re off – like a ferret down the trousers, like a greyhound out the trap, like Red Rum winning the Grand National – more like a snail with the scent of a Pansy in it’s olfactory senses. After the stress of getting the dash light sorted (previous post) we were all packed and ready to go with an early start in mind. Thwarted at the last minute – Janette runs a couple of chocolate shops with an online presence (Chocolate Gourmet) and the checkout system was not working. I attempted to sort but it was having none of it – I suspect a recent upgrade may be the issue. Anyway this is about our trip not work! We decided to take 3 days to get up to Inverness, the start point for the tour. Setting off about 9:00am, destination Lochmaben close to Dumfries, a little CL site. Weather was gorgeous, no annoying dashboard light, Hilma purring up the motorway like a seasoned traveller, what is not to like. The sense of release and freedom always surprises me when we set off whether it be for 2 days or 20. This is the start our second year with Hilma and so far (and I can’t see this changing), we love it. An early(ish) start for the drive to the next site in The Trossachs (I know all those jokes rattling around – sounds painful, etc.). Maragowan was the destination, a CC site, very pretty, sitting next to the River Lochay running into Loch Tay. 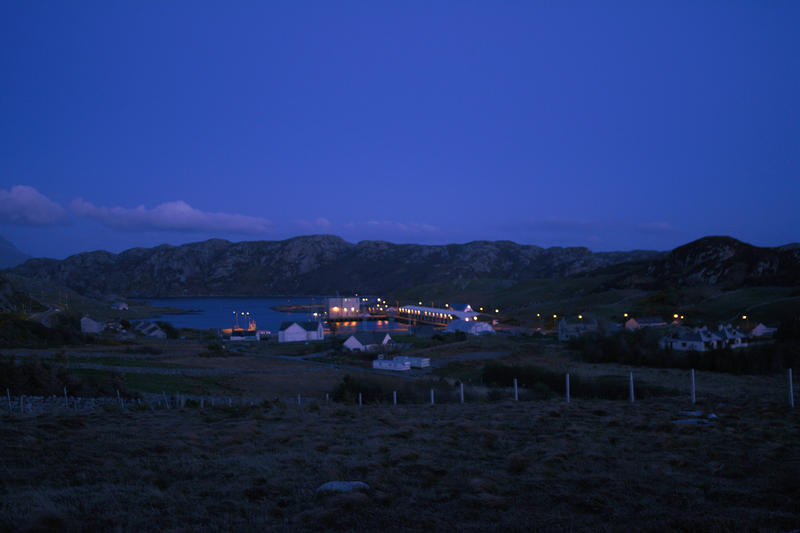 Very busy – we do prefer the smaller sites but this was a convenient stopover so we would only be here one night. Booked a meal at the Bridge of Lochay Inn, a short walk from the site, talking ourselves into treating ourselves ‘as we were on holiday’. I have got back in to my running and had a fantastic early morning run along the river before breakfast – beautiful sunshine but chilly. We were on the road by 9:30am and driving on the A827 along the side of Loch Tay. Mrs.Garmin tried to take us down a road that had a narrow bridge (7.5ft) and as Hilma is of the same girth we gave that a serious miss (although I’m sure the drive would have been spectacular). Warning – this A road felt like a B road – twisty and sometimes narrow. Our next destination was Culloden Moor just outside Inverness ready for the true start of the NC 500. Great views all the way and we found the site easily enough – went for the usual afternoon walk to stretch the legs. 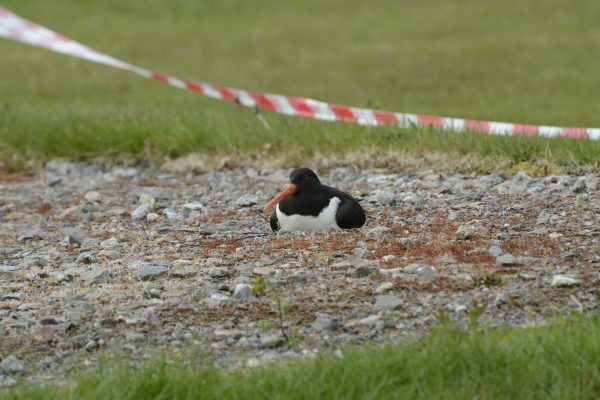 An Oystercatcher had decided to take up residence on Pitch no.43 and was duly roped off! Dark and dingy with the promise of light. 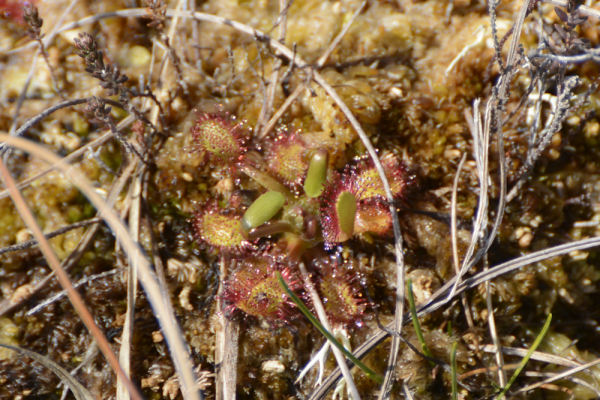 Not sure what kind of moss – possibly a Liverwort of some sort? 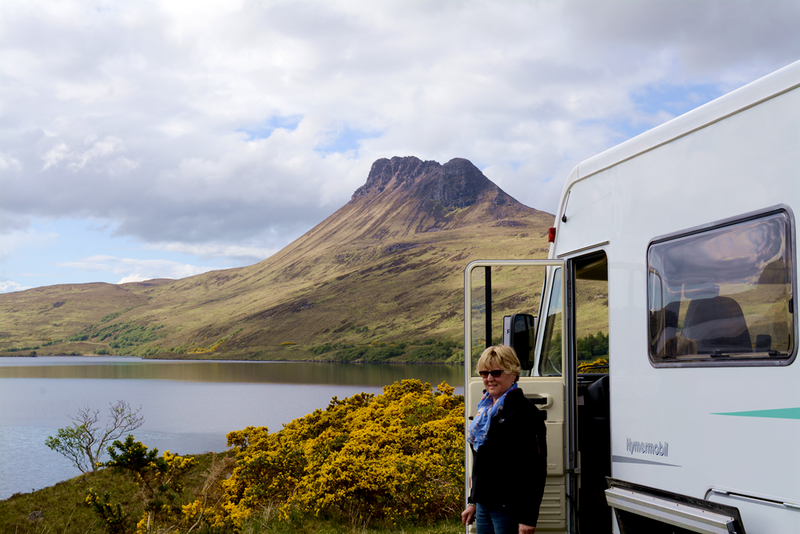 This entry was posted in North Coast 500, Our 2nd year, Travels in Hilma and tagged Dumfries & Galloway, Hilma the Hymer, Loch Tay, Maragowan, Motorhoming, North Coast 500, Oystercatcher, Scotland, The Trossachs on May 8, 2017 by studio1901. 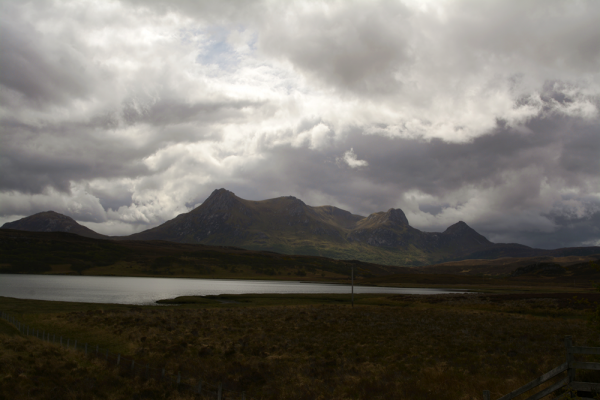 Strictly speaking this first post about our Scottish trip is about getting to the NC 500. We live a good few hours away from the Scottish border and so as the North Coast 500 starts at Inverness we did not want to feel like chewed cardboard by dashing up there to start (besides Hilma doesn’t go that fast anyway). The panic set in the week before when we had an ‘injector’ light on Hilma’s dashboard stay on permanently. I didn’t fancy 3 weeks and 1500 miles of wondering what might happen if I ignored it. So I had a cunning plan, ask our usual MOT chap to plug her in to his fancy computer ‘thingymajigg’. Cunning plan A goes wrong, “no can do” says MOT man, “can’t get a readout, let me try ‘supercomputer 2′”, he says. plan B goes wrong, – supercomputer 2 says “NO”. On to plan C – contact the people who serviced, MOT’d and swapped all the lights when she became a UK citizen, “No problem – yes we can sort that for you”. Plan C slightly thwarted as it was a bank holiday – had to wait 72 hrs. Plan C was now in full operation with me driving 1.5hrs to get Hilma to the workshop. I was there 15mins and techy workshop man come out and says their ‘superdooper diagnostic thingy’ wouldn’t plug in – Hilma was too old! What an insult! I told her not to listen and I would help her feel young again. Plan D immediately came in to play, I would visit a FIAT commercial dealership on the way home, find out what they could do for – things were getting a little close by now, we now only had 3 days before we were setting off. Great news, Mr.FIAT commercial with a lot of intakes of breath and hurrumphing finally ‘mangaged’ to squeeze Hilma in – the day before we were due to go to Scotland – last chance saloon. Still, it would be worth waiting another 24hrs for the professionals to give her some tlc and get her right before our trip. Plan D was only a 40 minute drive this time (good job I filled Hilma’s fuel tank a few days ago ready for the NC 500). Up early, on the road before 7:15am in order to get her to Mr.FIAT on time. Yep – you guessed it – same result as Plan B – Hilma was ‘too old’, poor girl, by now she was really starting to get a complex. Needless to say the air at Mr.FIAT’s ‘professional’ dealership was fairly blue for a while – they did mange to print out a list of all dealers between home and Inverness for me – I was getting to feel I might be visiting a few of them at this rate – and if anyone called Hilma too old again I felt like I would ‘lamp them one’. Well feeling pretty despondent by now I was getting a little tired of all this, we had not even packed yet! 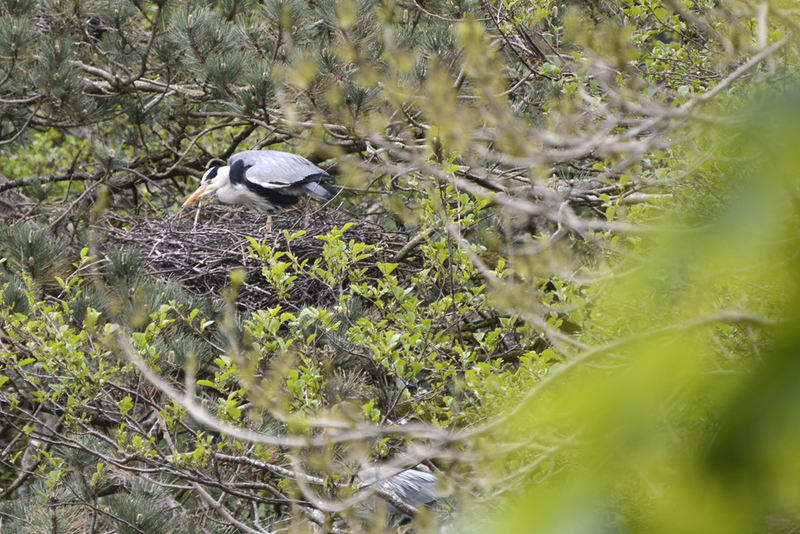 Home – think, what next? OK – ring nearest other expert Mr.FIAT commercial. Una answered, what a nice lady, “yes of course we can help” (this phrase was starting to wear a little thin by now), I explained our predicament and covered the delicate subject of Hilma’s age. It was at this point Una said, “aahh – I’ll go and ask our Senior Technician” – my heart was in my mouth whilst the canned muzak was playing. Una came back on the phone “Can you bring it in today?” (I resisted the temptation to say Hilma was NOT an IT – sad I know) – I nearly leapt down the phone “Yes, of course I can – now?”, “1:30” Una replied. This was it, I could feel it in my bones, Hilma was being looked after, nothing could stop us now. So off Hilma and I trotted, another 90mins to another Mr.FIAT professional who seemed to know that she was a bit of an ‘old girl’ and needed specialist care. Upon arrival I was ushered to a nice seating area, coffee, newspapers and a television, things were feeling better (although I wasn’t sure how my wallet would feel afterwards). After reading some news, looking around the showroom and 2 cups of coffee later I was getting worried, we were due to set off to Scotland within 18hrs and Hilma was stuck in a workshop. Una came around the corner, I couldn’t read her face but I was sure it was bad news. She said (with a blank look on her face) that the technician (here we go I thought) had managed to clear the fault, had driven Hilma up the road and the light had not come back on. HURRAH I nearly jumped for joy and kissed Una – but the usual English conservative attitude kicked in and all I could say was “thankyou”. Sigh – what a relief. It turned out to be a faulty cooling fan relay. And the wallet was only £85 lighter (I must have spent that much on fuel following Plan A to Plan E). This entry was posted in North Coast 500, Our 2nd year and tagged Hilma, NC 500, North Coast 500, Scotland on May 7, 2017 by studio1901.